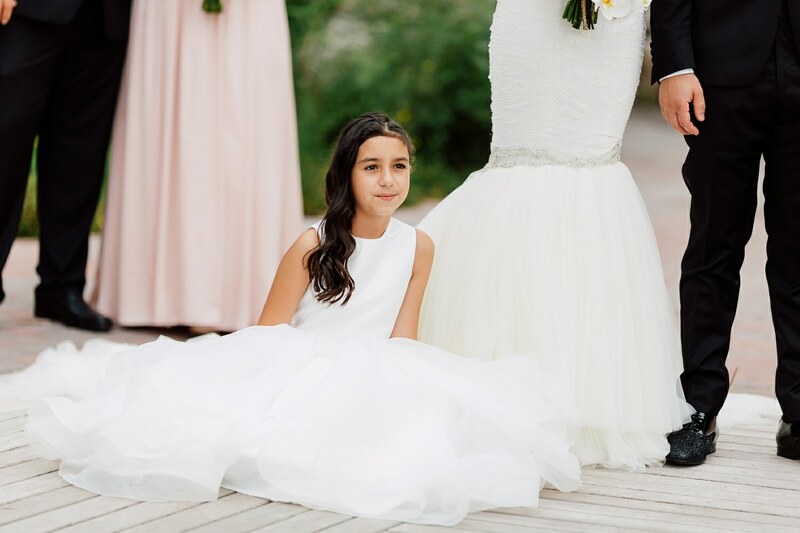 For Samira, fashion is purely a form of self-expression and there are no rules. 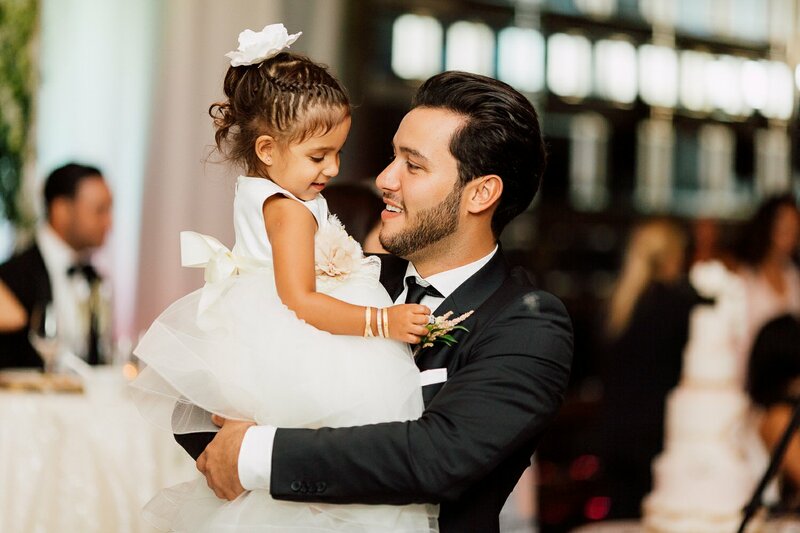 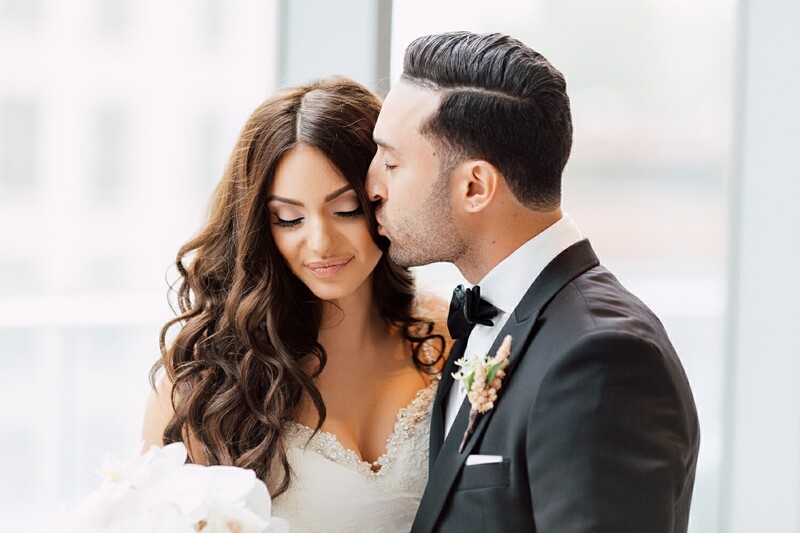 This style guru definitely transformed the aisle into her personal runway, while her man, Joseph, a stylish man himself waited for her princess at the altar. 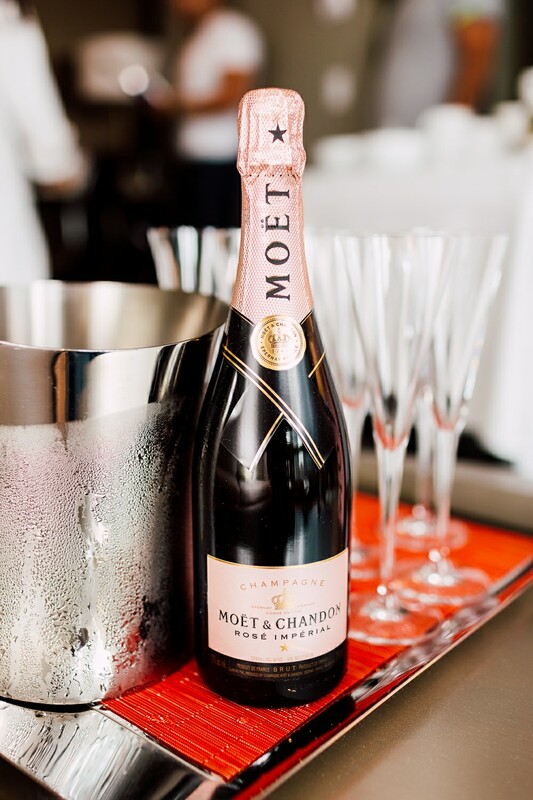 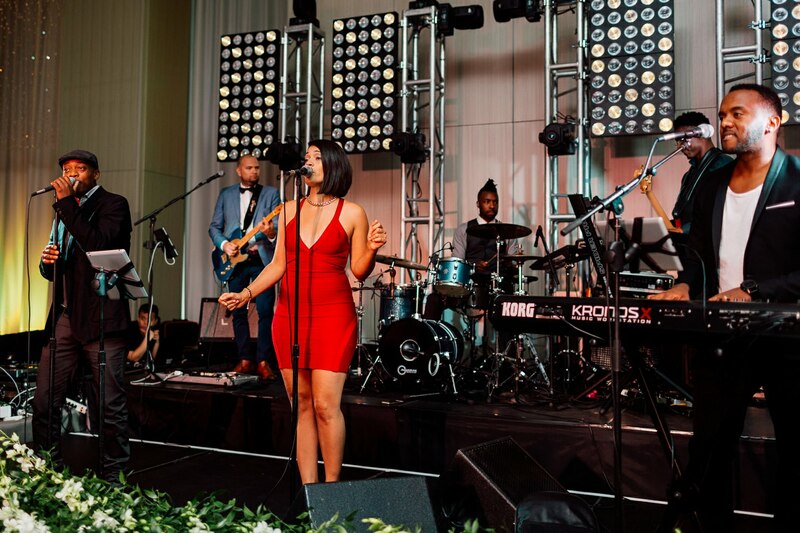 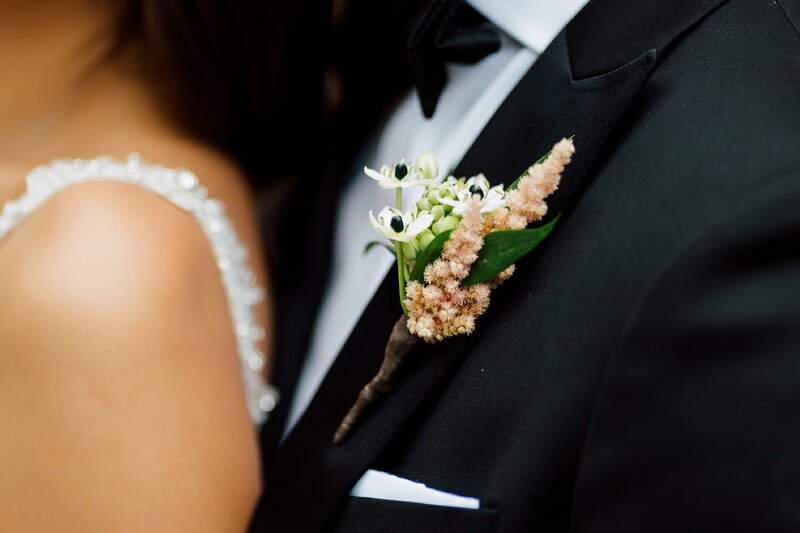 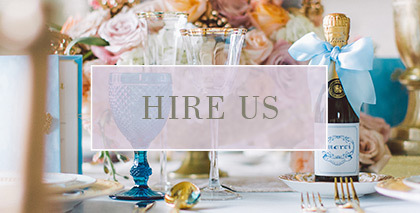 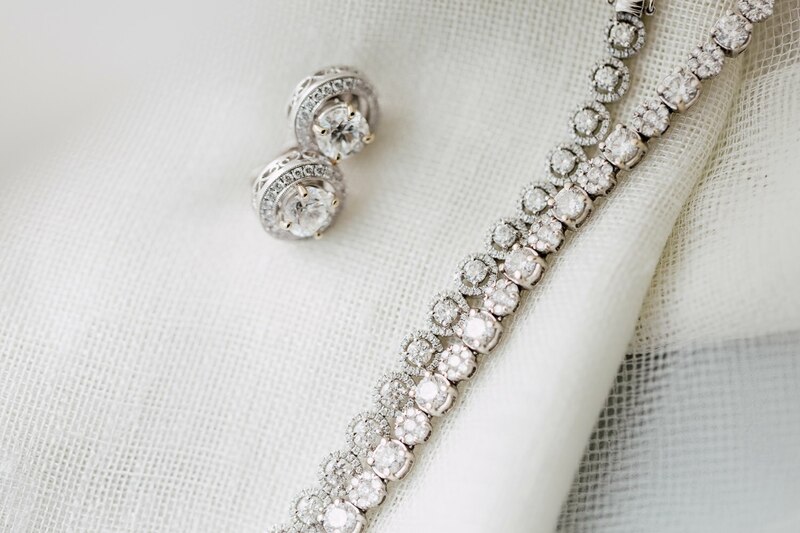 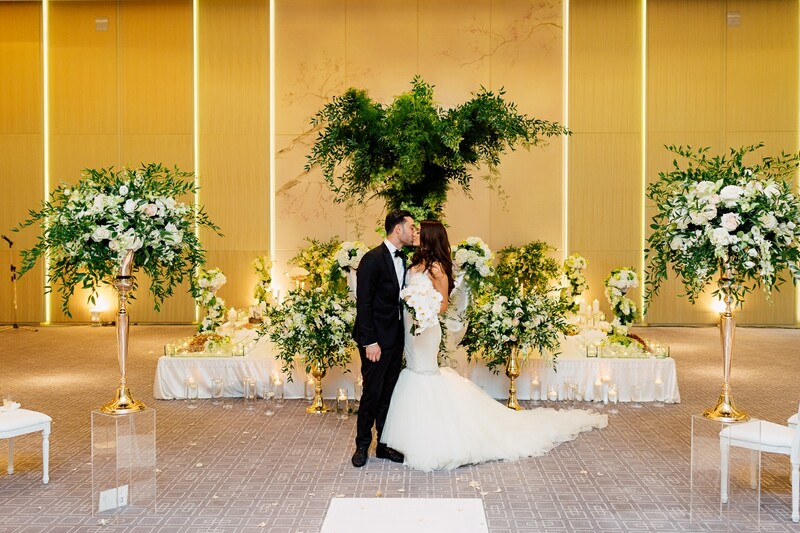 The Kazemeini – Cimorelli nuptials has all of the elements of a perfect wedding celebration – a stunning bridal gown, a wonderful ceremony, a sumptuous feast, and most important of all, the couple’s enduring love for each other. 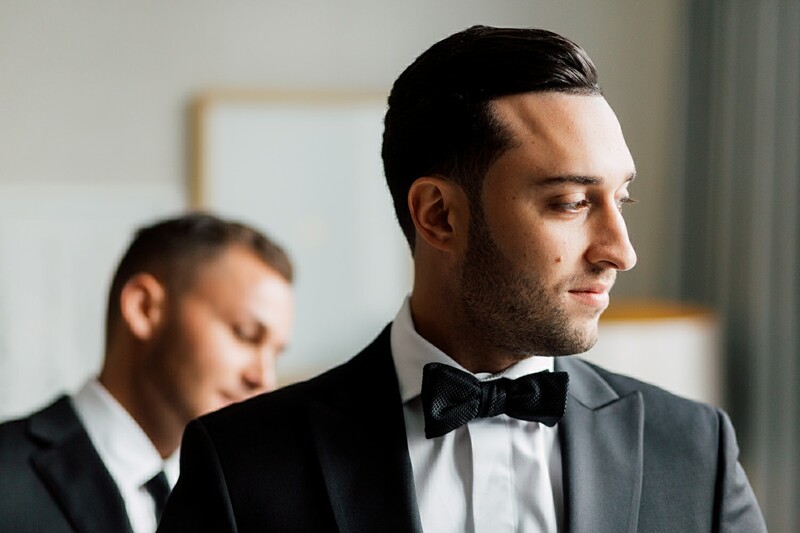 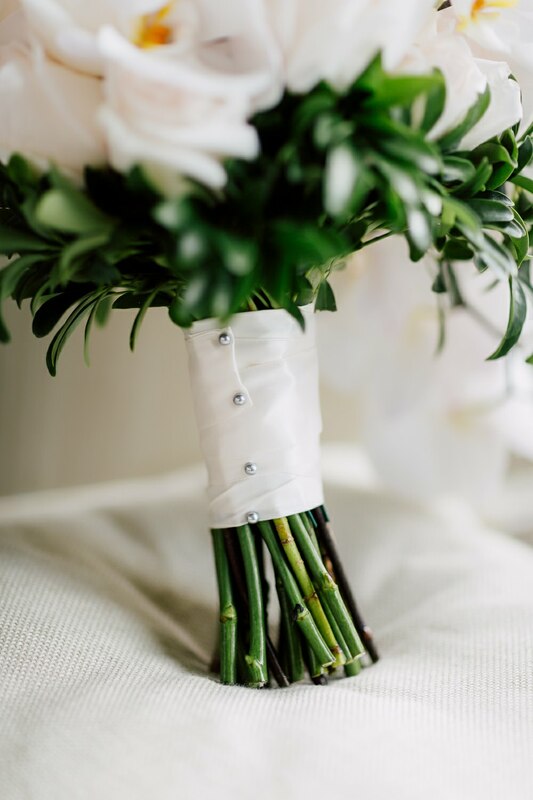 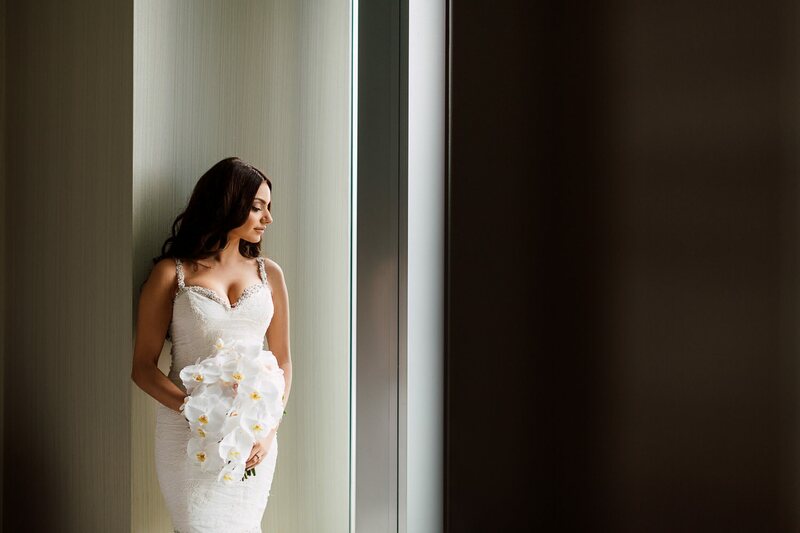 Classy, elegant and sophisticated, you cannot fully find the right words to describe the stylistic and affectionate journey of Samira and Jo until they finally arrived at their wedding day. 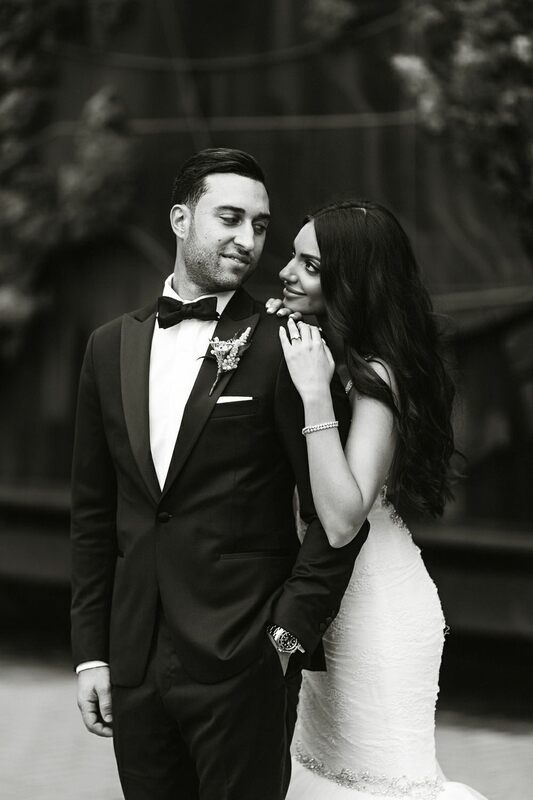 These two lovebirds are innately fashionable and yet supremely humble and wonderfully down to earth. 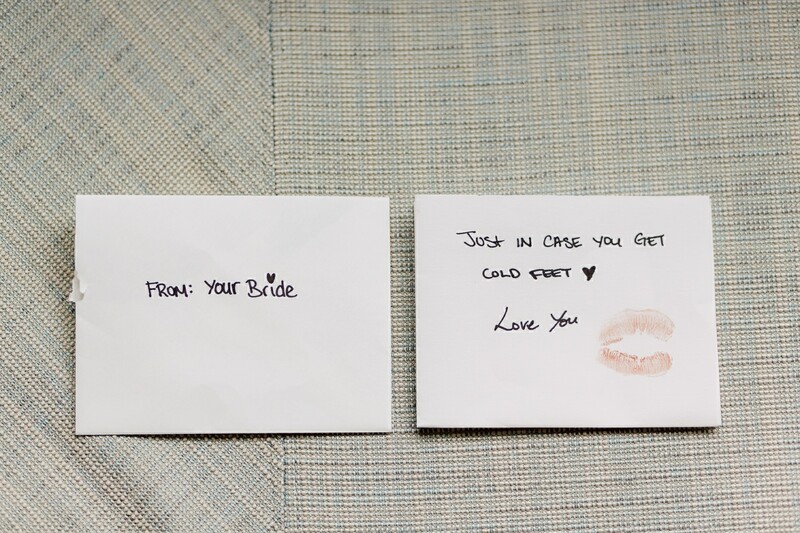 It is undeniable that they are madly in love with each other. 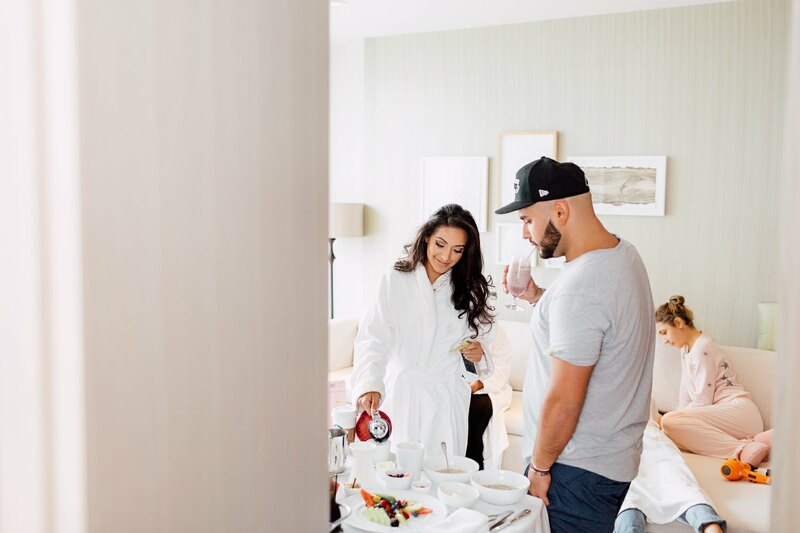 The moment the photography team got to talk to the stunning couple, they got along easily because of Samira and Jo’s kind nature and warm personalities. 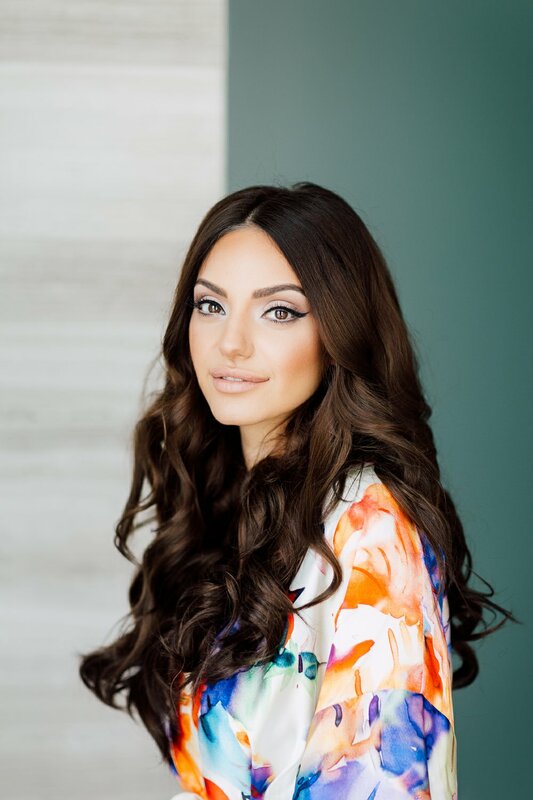 Who would have known that Samira is the owner of BLK Sheep Boutique and the manager of the shop’s popular Instagram account which has an impressive 19k+ followers and is still growing? 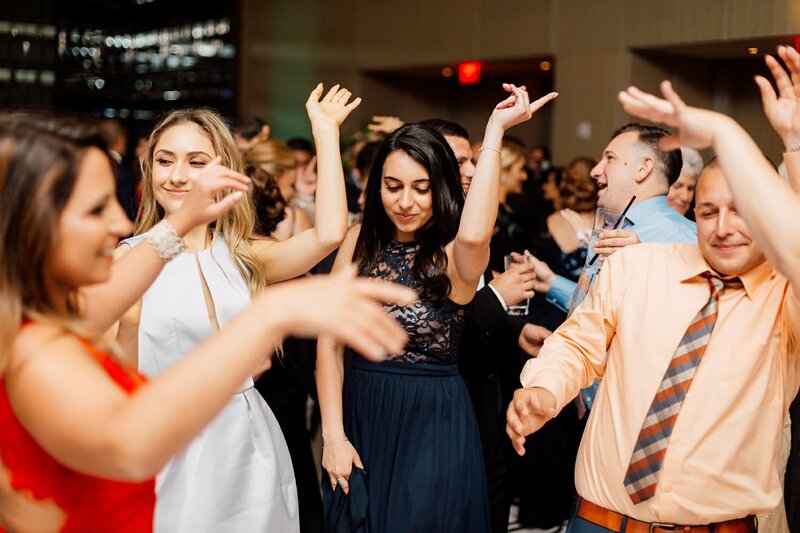 She didn’t show a sense of air and was goofy and fun to be with. 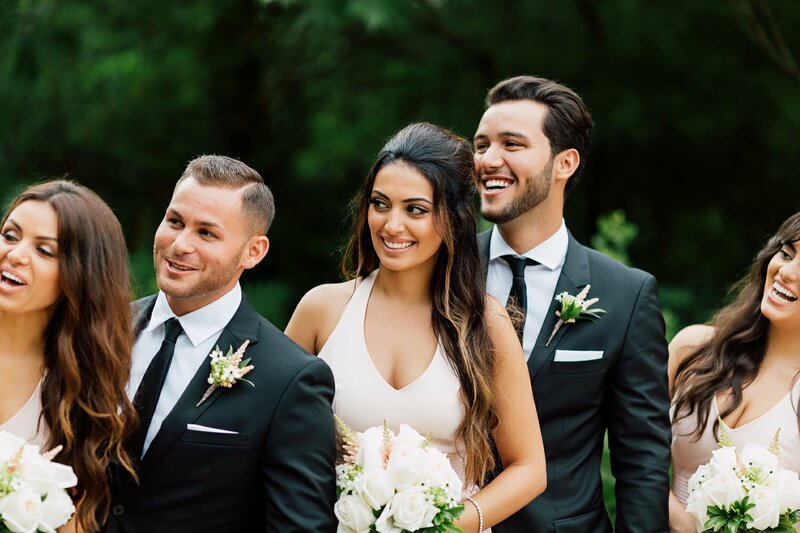 The team definitely enjoyed the entire ride with the lovely couple. 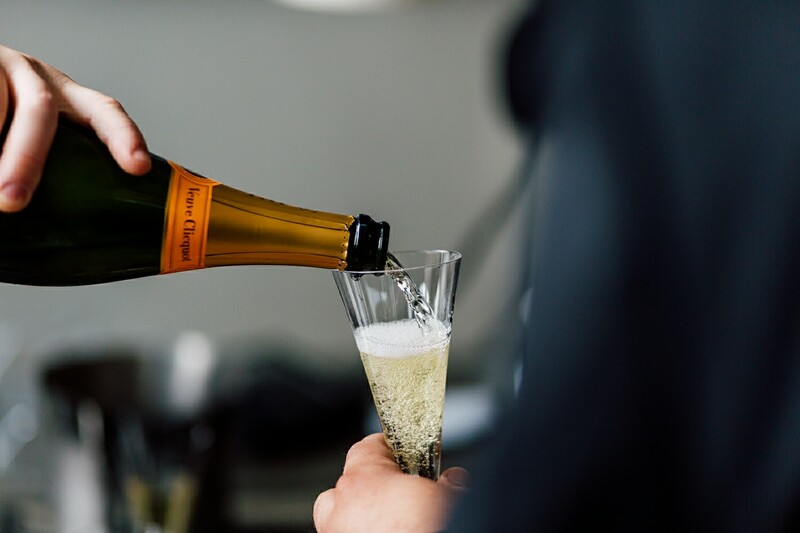 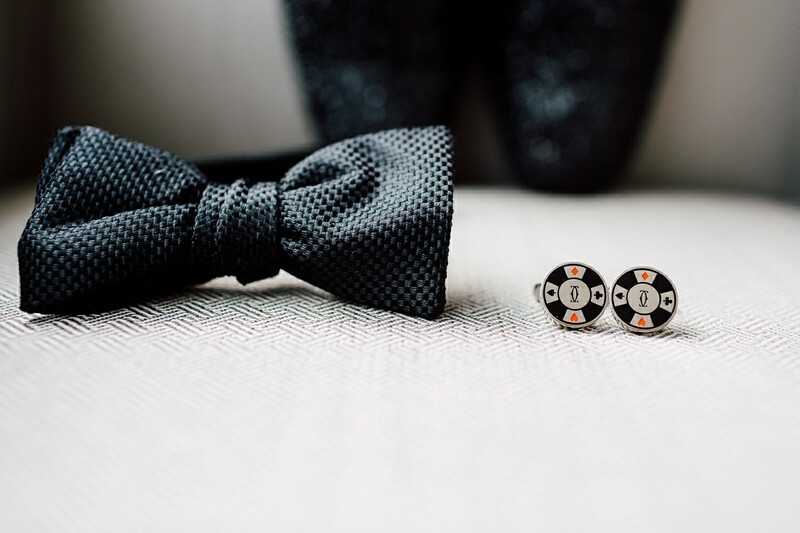 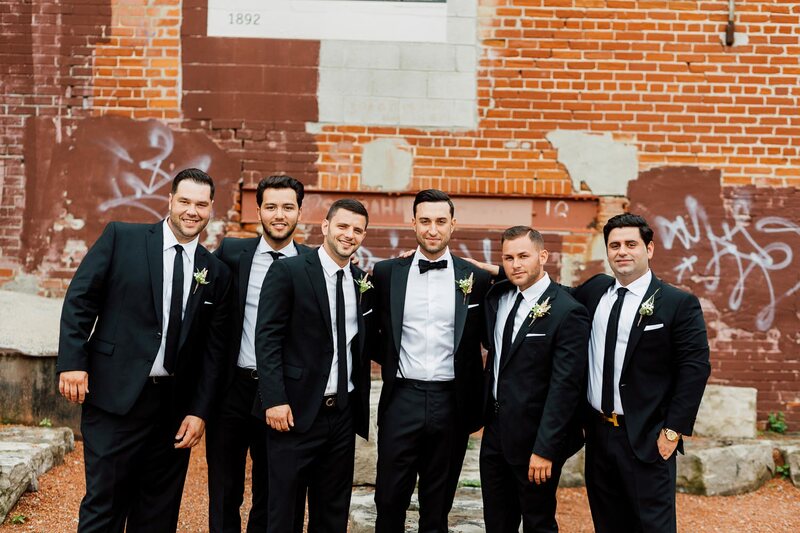 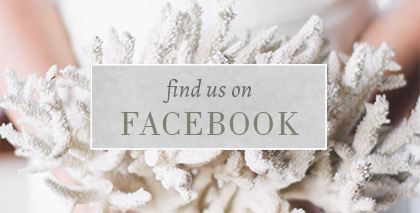 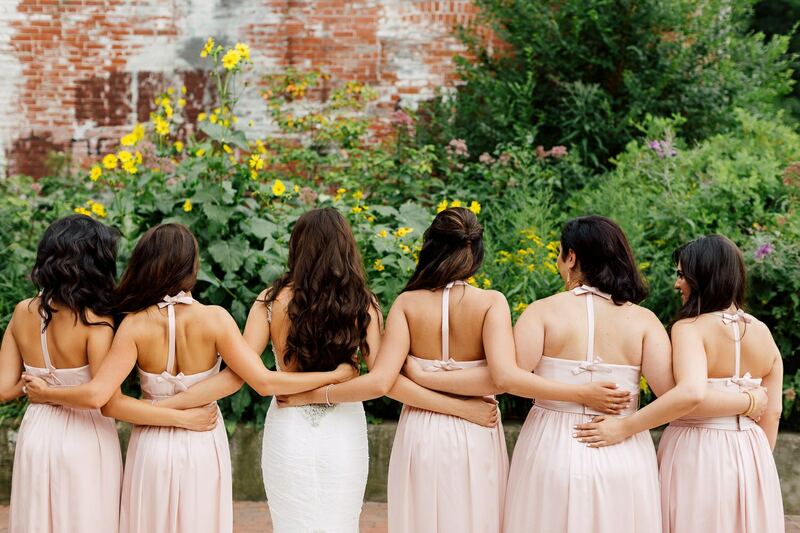 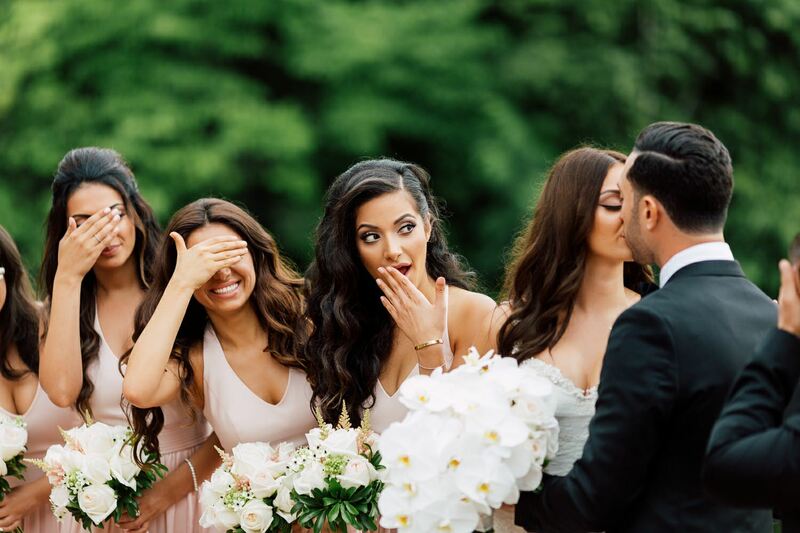 The whole journey from the engagement party, to the bachelorette, bridal shower, rehearsal dinner, and the main event was such a fun experience and definitely one of the team’s most favorite wedding photoshoots in the year of 2015. 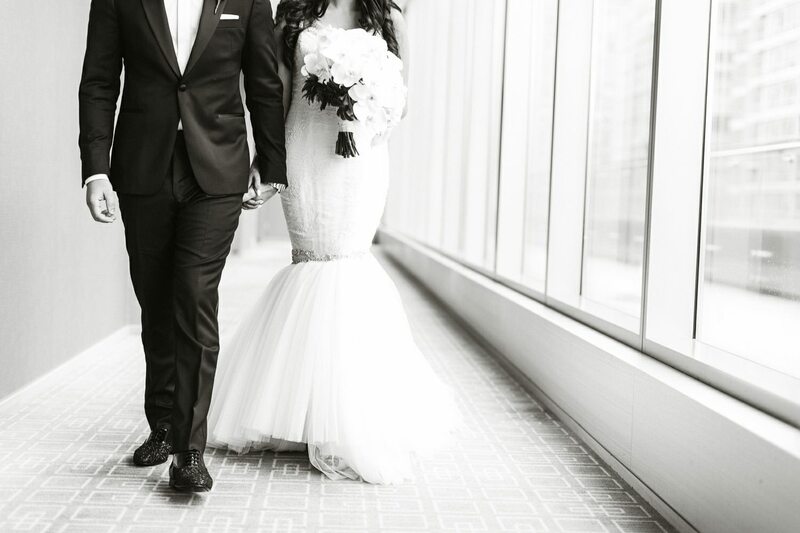 The couple looked like celebrities and a powerful one at that. 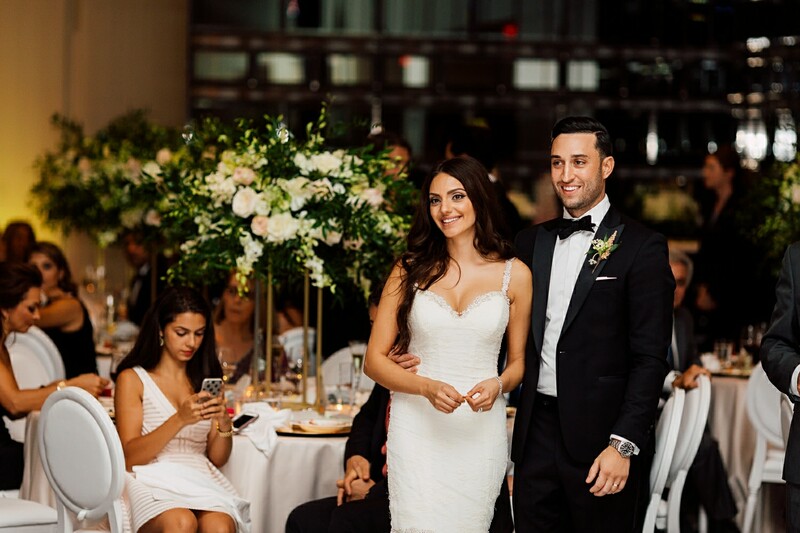 The Persian beauty exuded grace and a fetching, exotic ambiance while her Italian counterpart looked equally attractive and awesomely eye-catching. 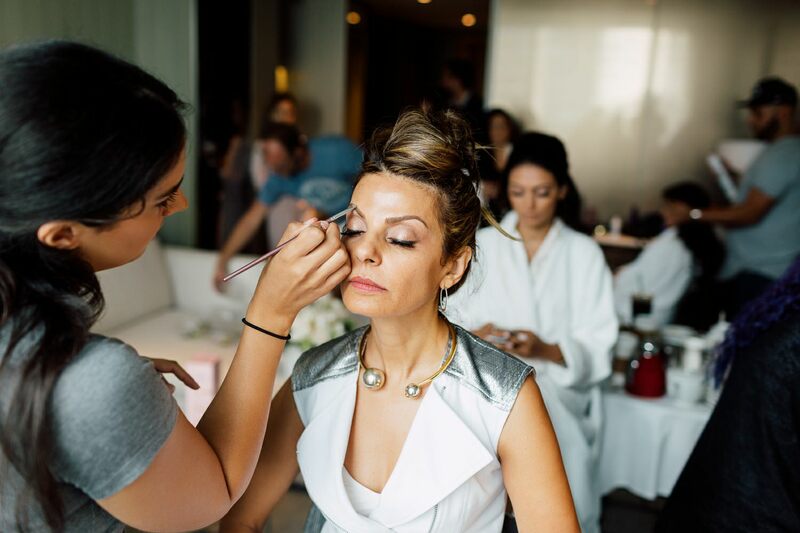 Samira wanted a natural look for her makeup and opted to accentuate and enhance her beauty and not exaggerate it. 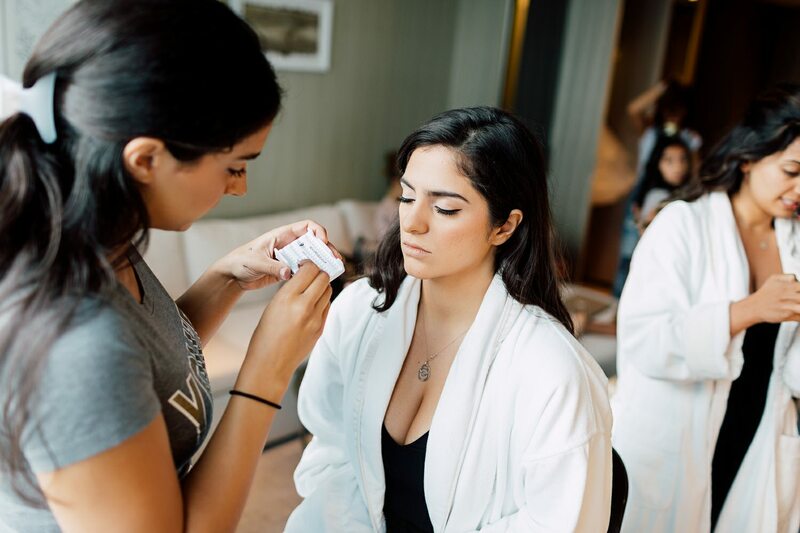 She wanted for her long and shiny hair to look not too done and effortless and in her own words, “I woke up like this!” Samira posted on BLK Sheep’s Instagram page and was able to find the perfect hair and makeup artist to prepare her for her most awaited day. 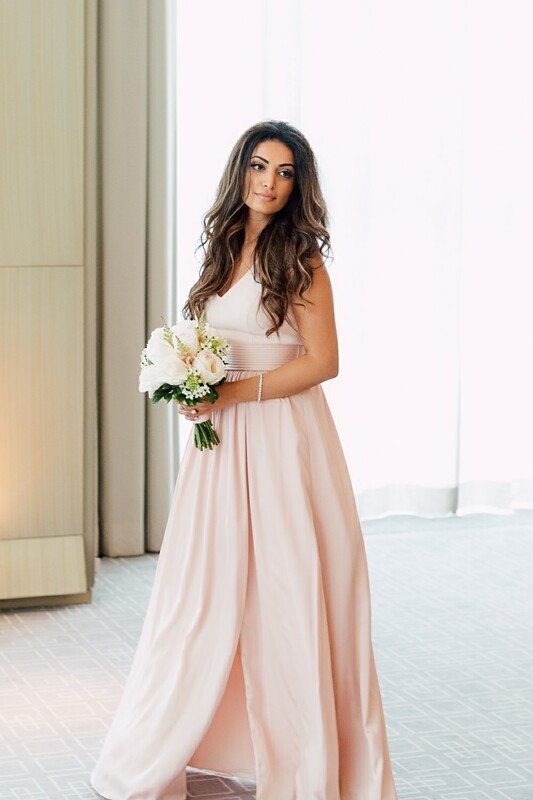 @makeupbyjenvoy did a great job and made Samira look positively glowing. 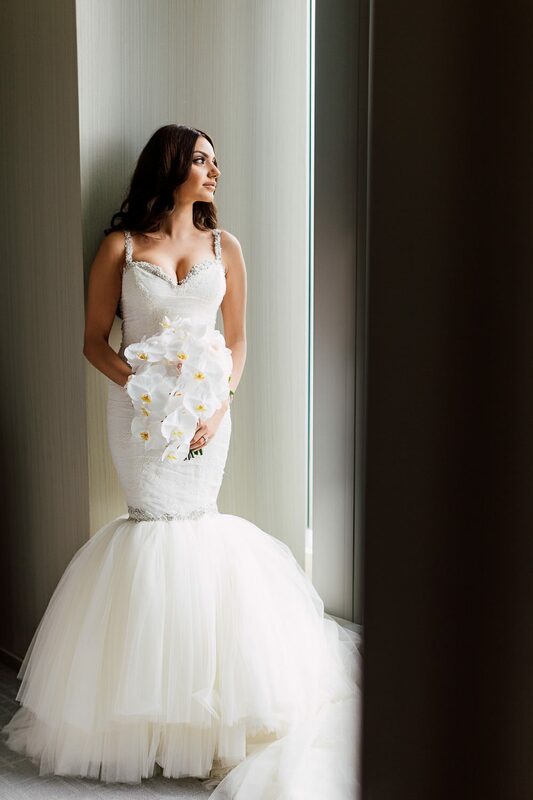 Samira’s mermaid wedding gown which was designed by Ines Di Santo perfectly showed her voluptuous figure which is totally enviable. 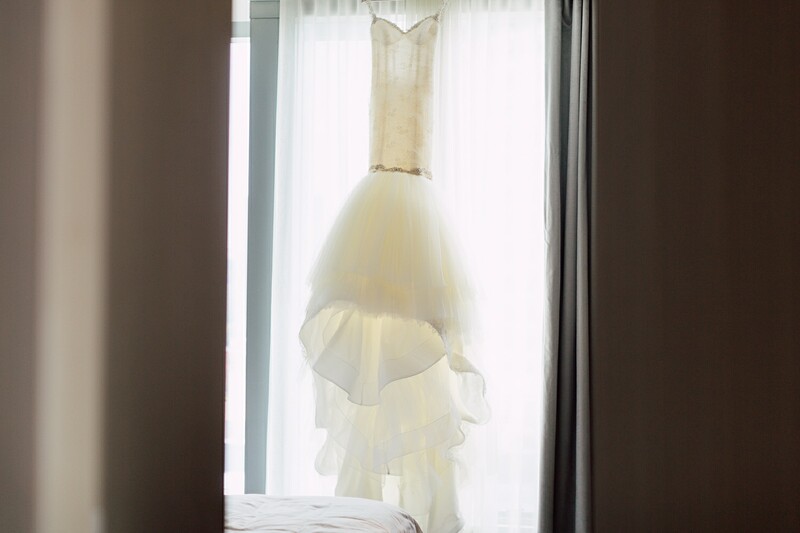 She made some subtle changes on the dress to make it her own. 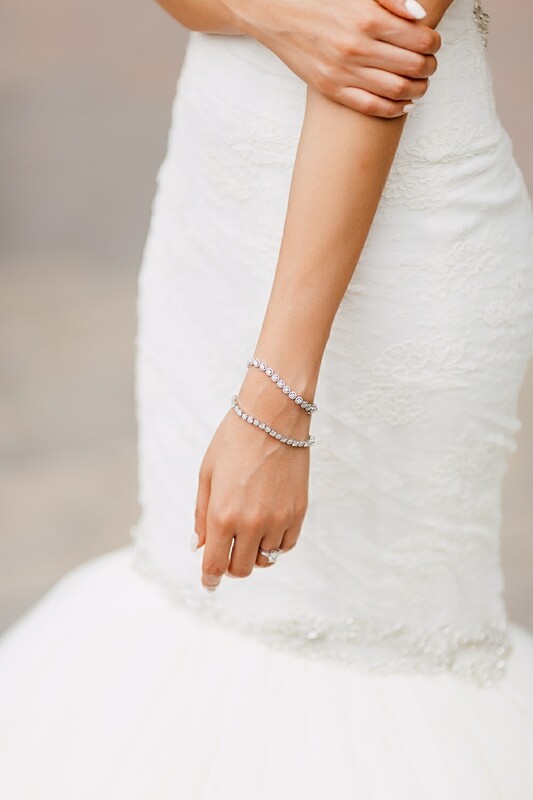 Samira added the straps and eliminated some beadworks and asked the color be changed to ivory instead of the original two-tone to make it slightly traditional. 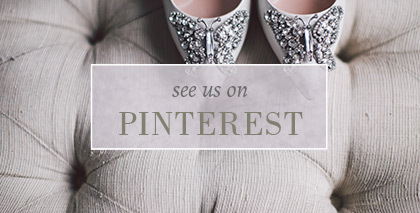 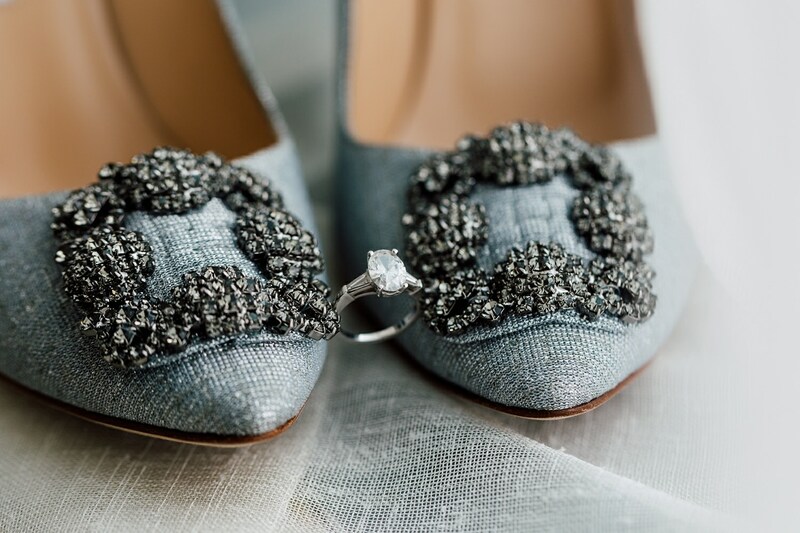 She wore a Manolo Blahnik “Hangisi” silver pumps with a fabric finish because it reminded her of Disney’s Cinderella, and she chose a style that she could wear again after the wedding. 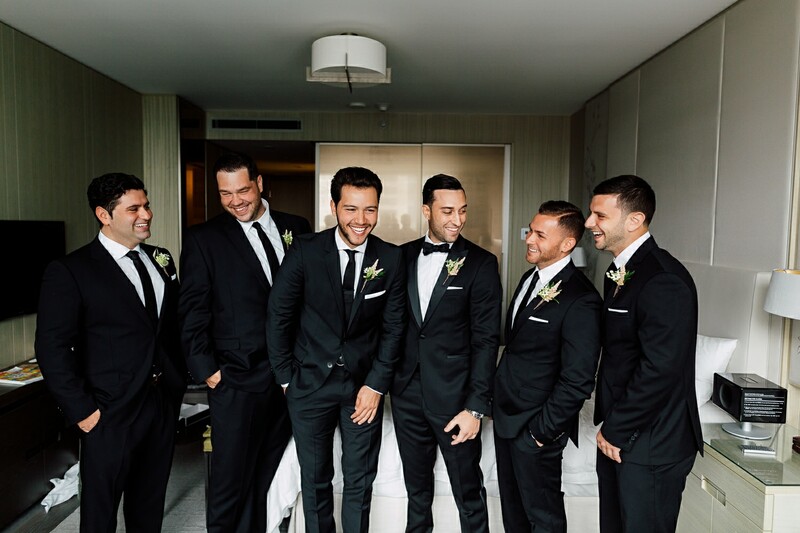 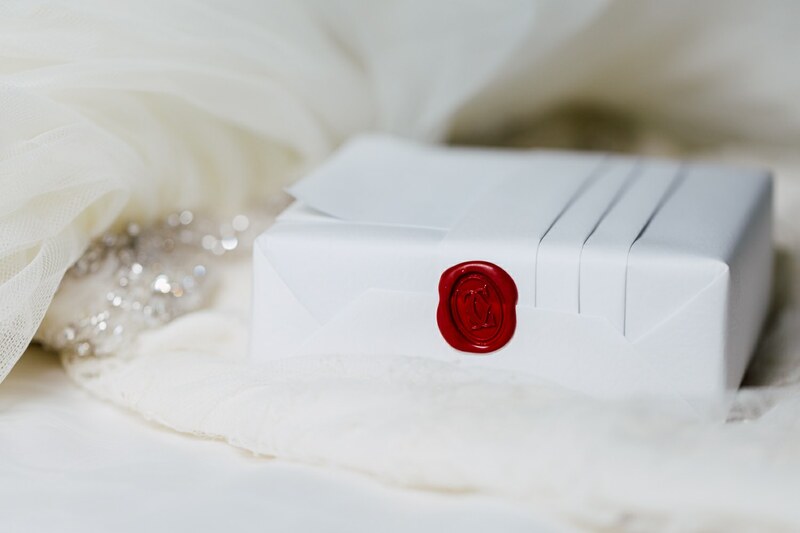 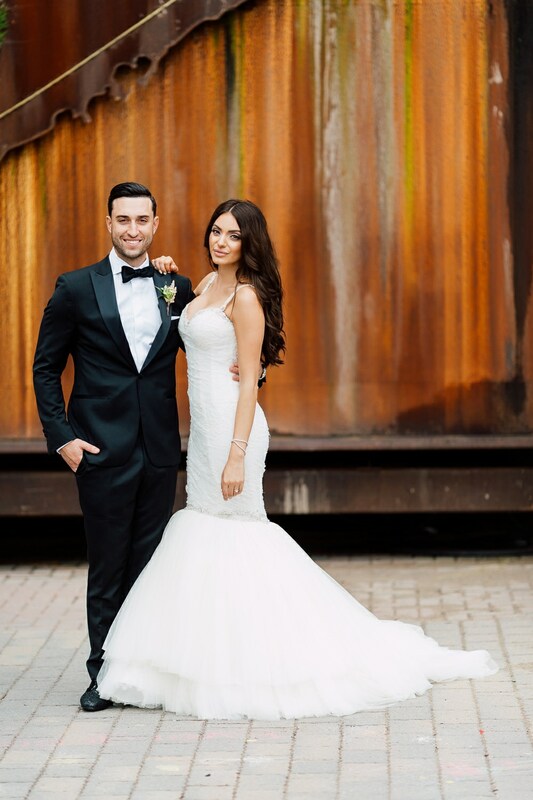 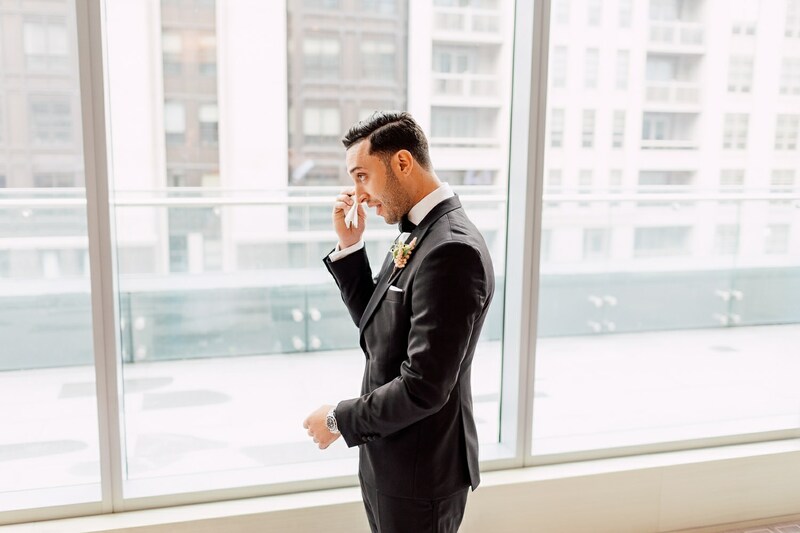 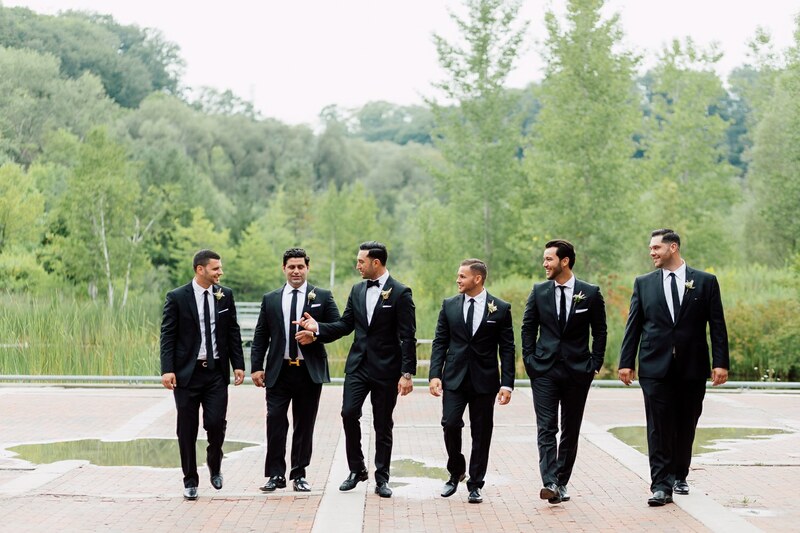 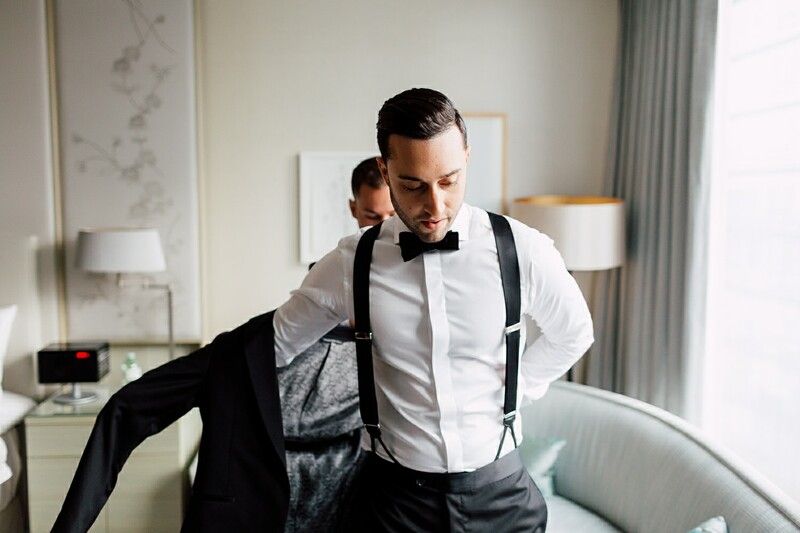 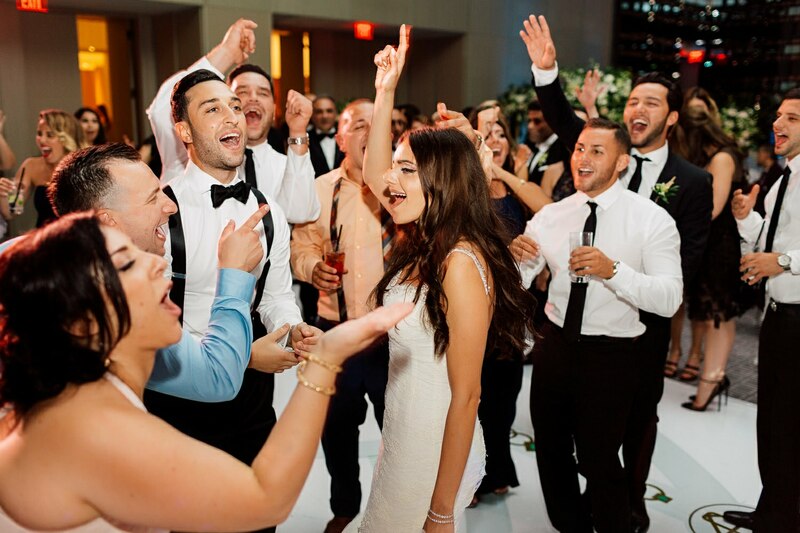 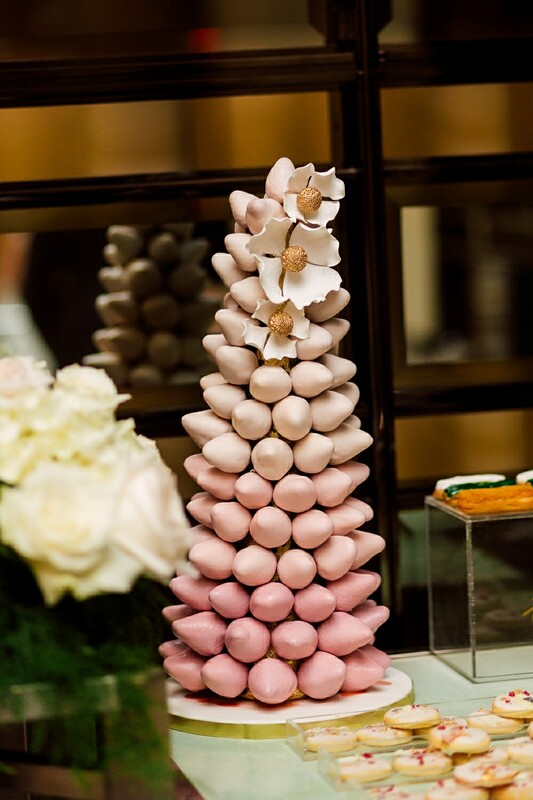 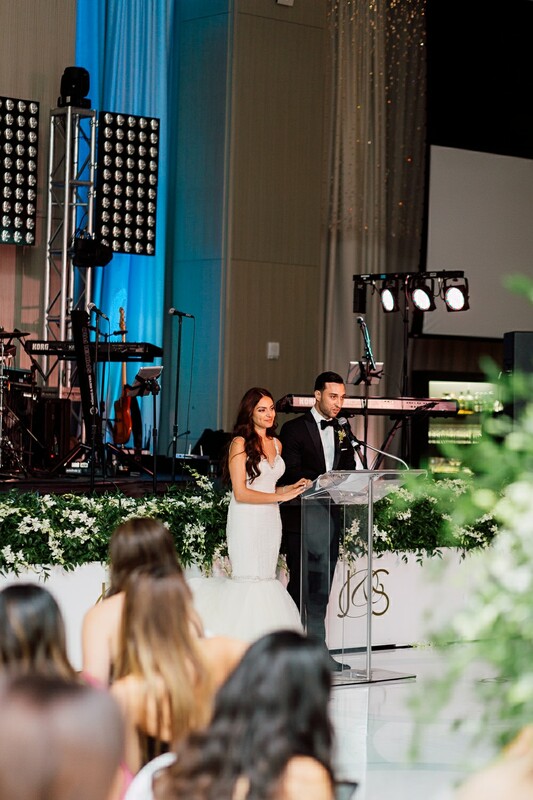 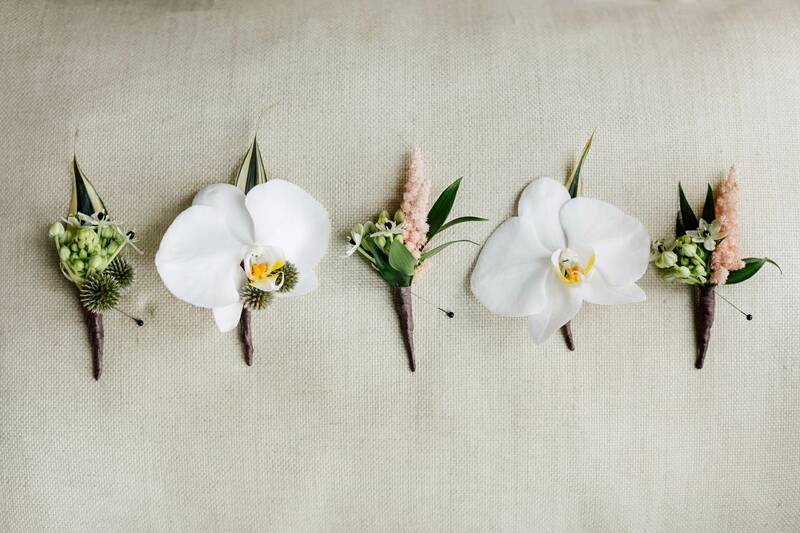 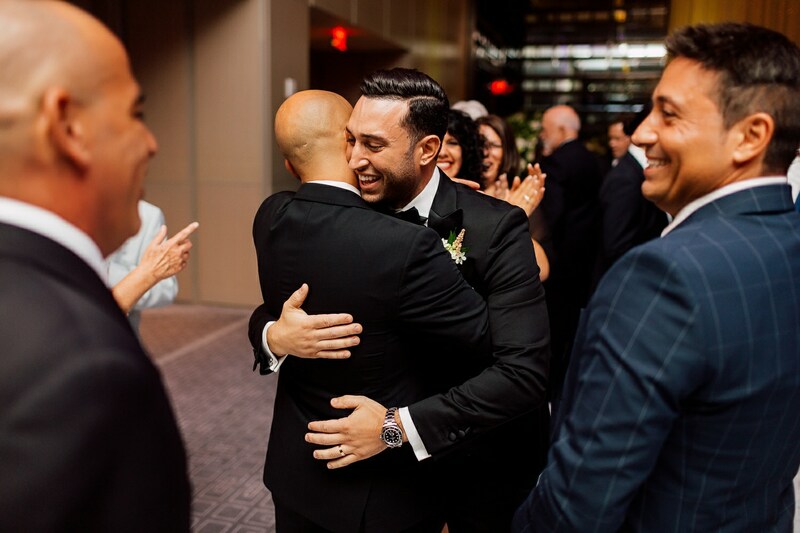 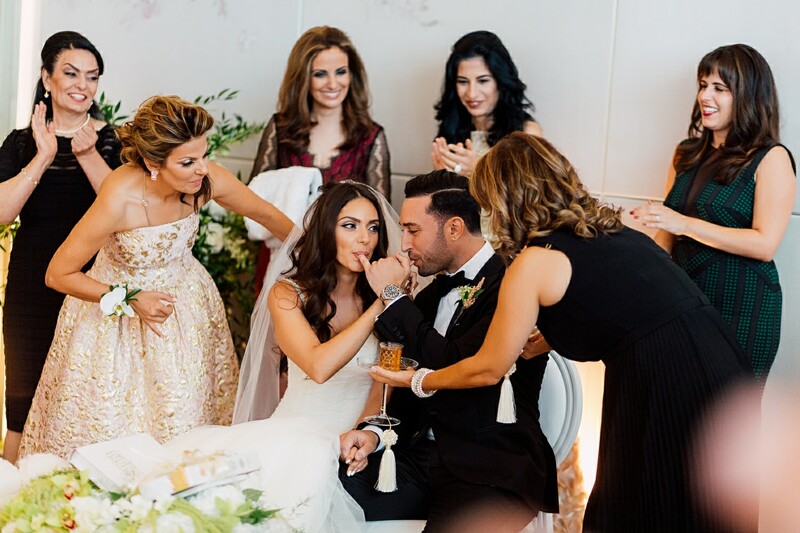 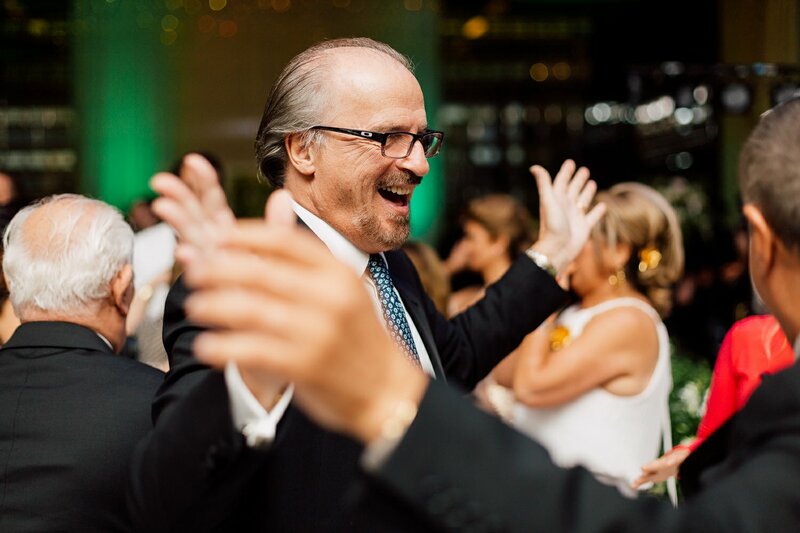 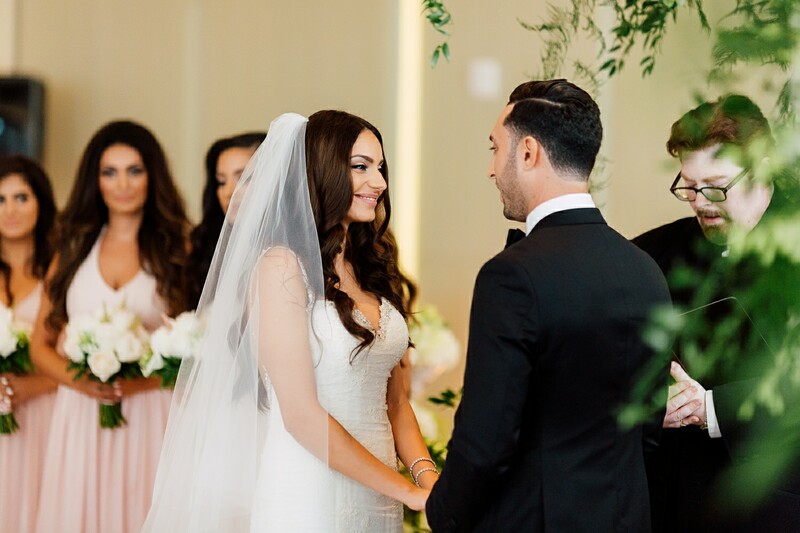 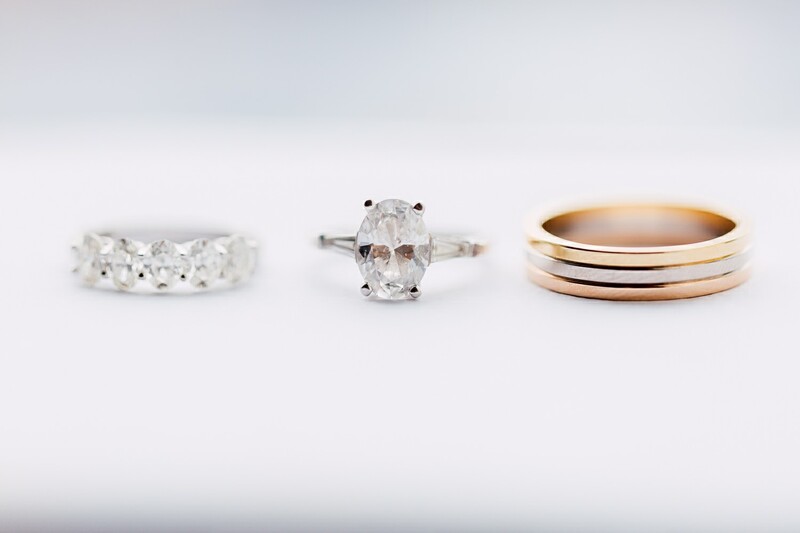 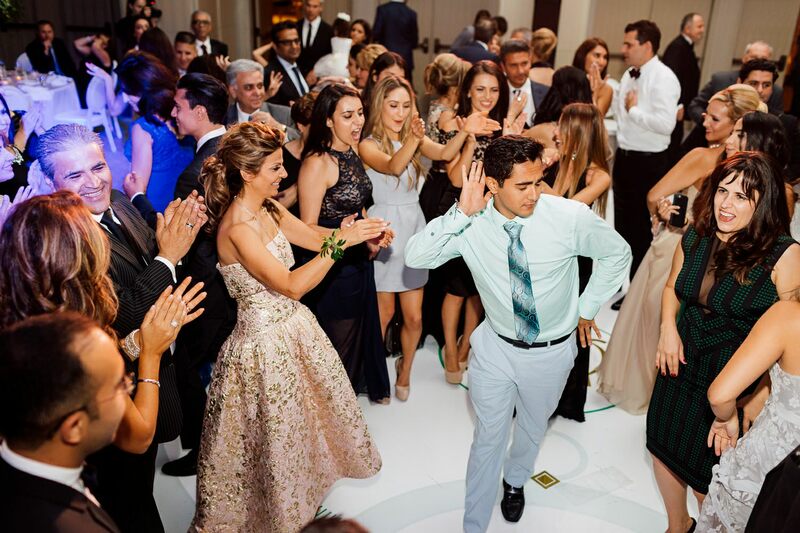 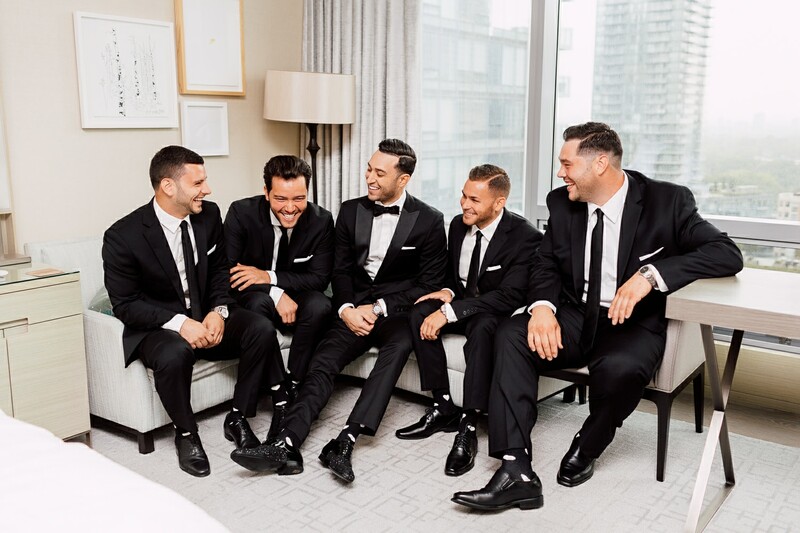 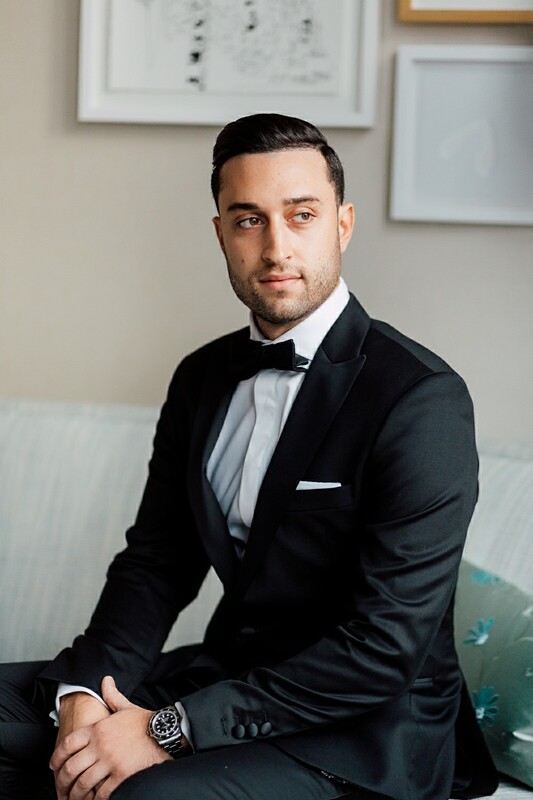 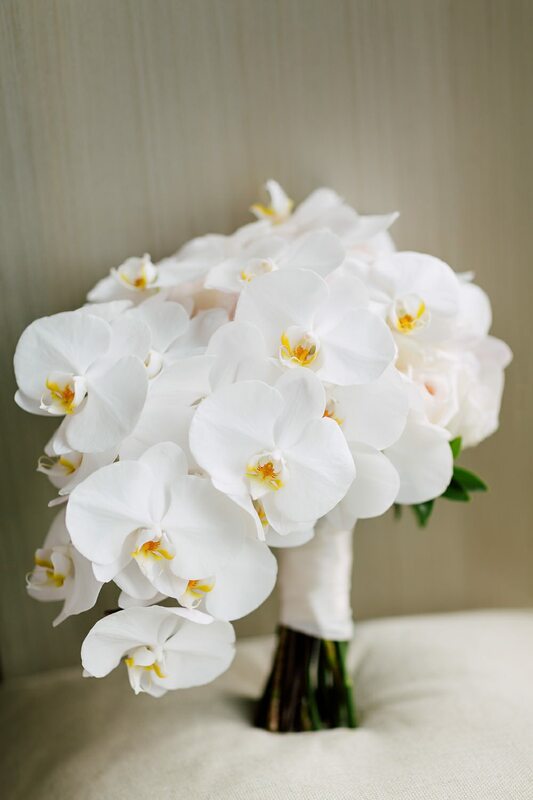 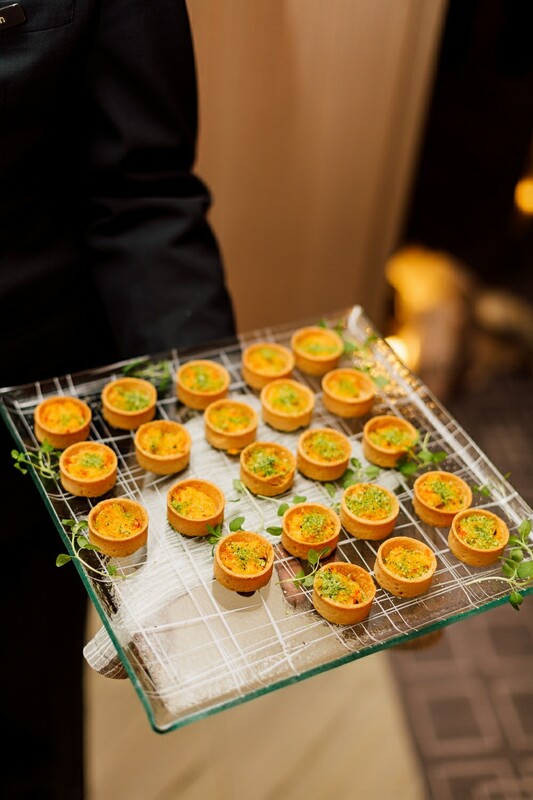 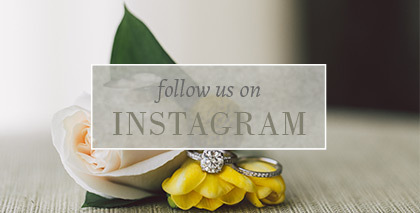 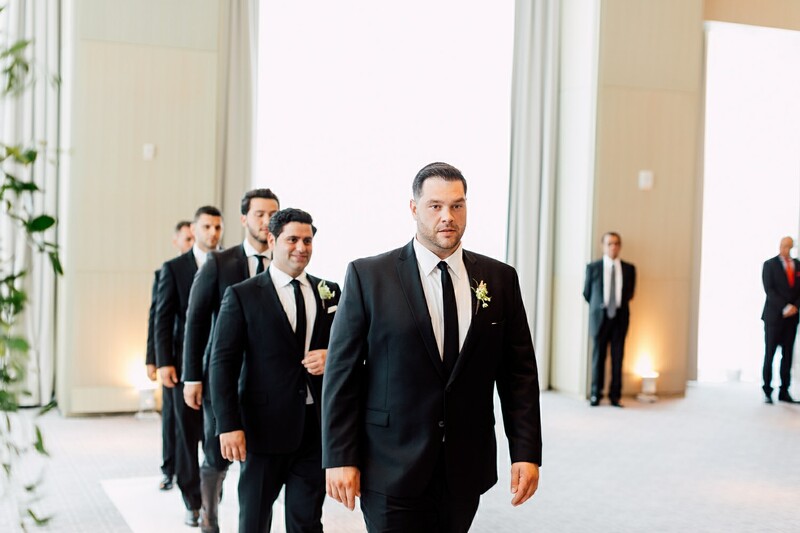 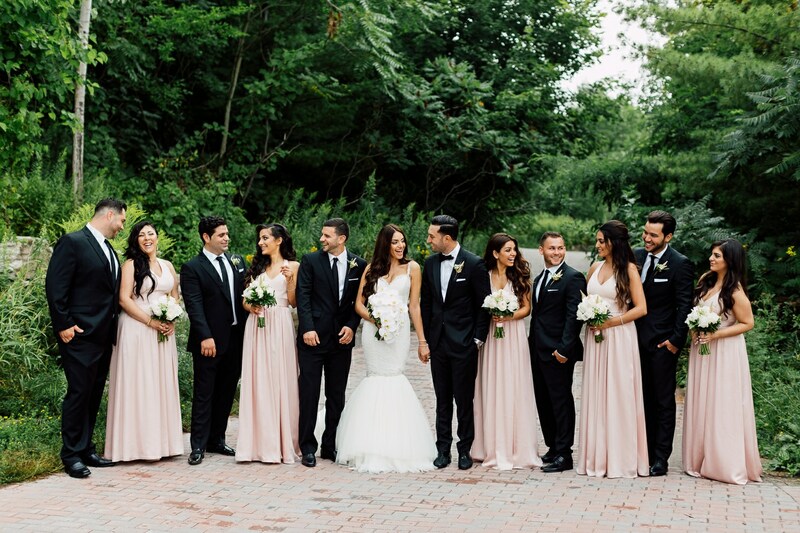 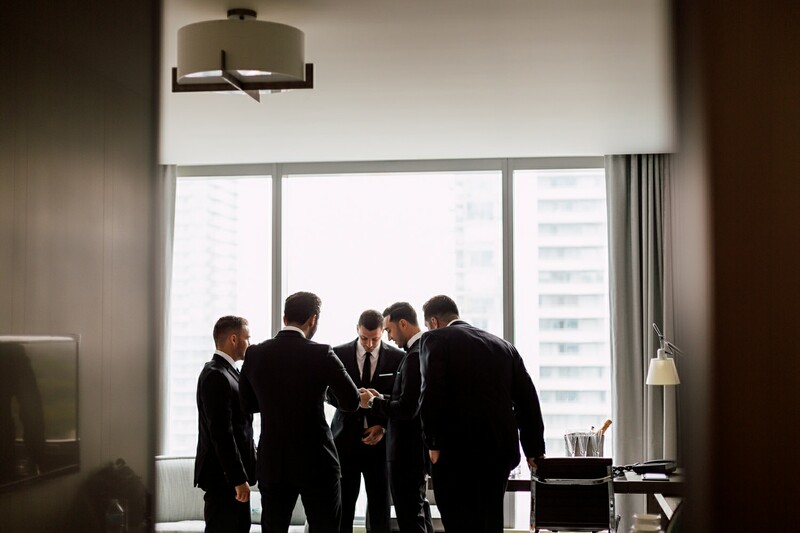 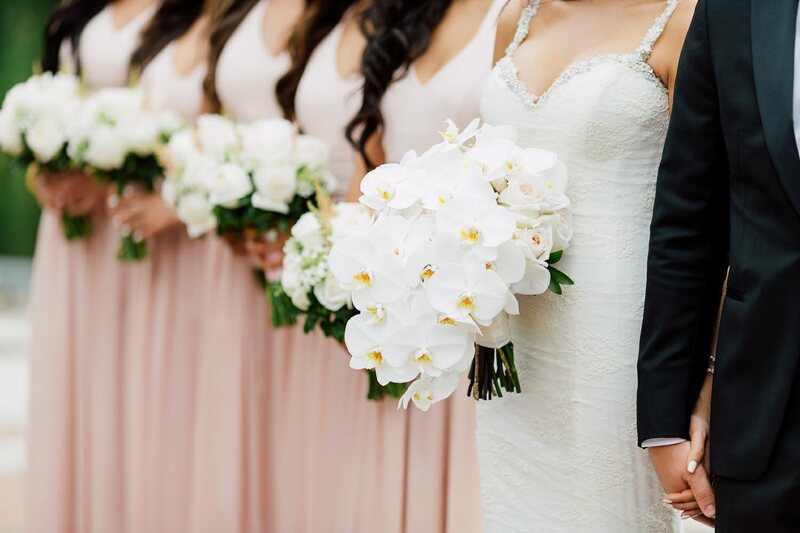 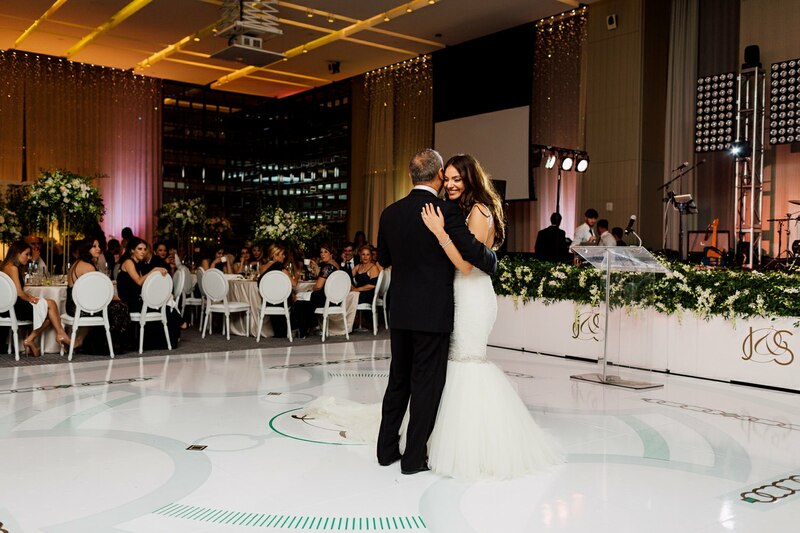 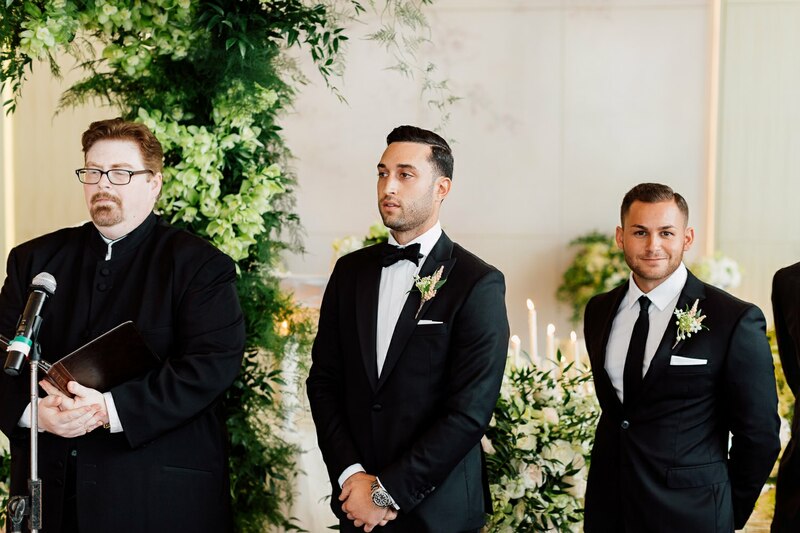 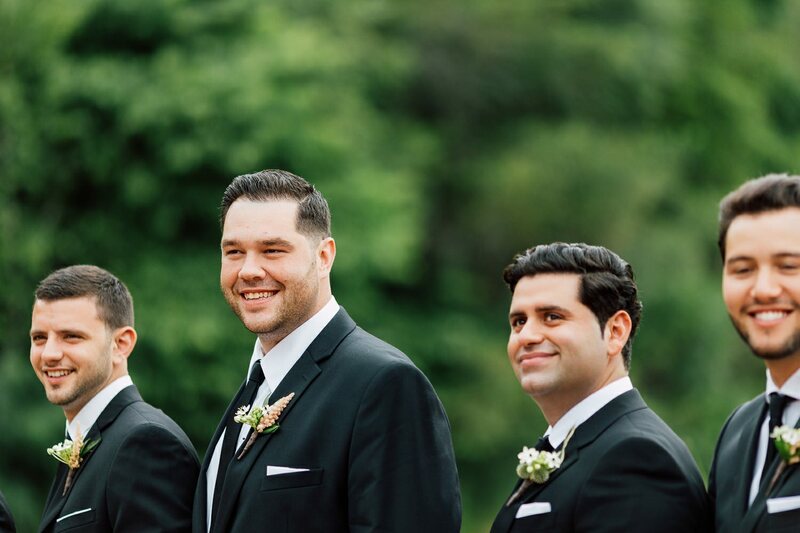 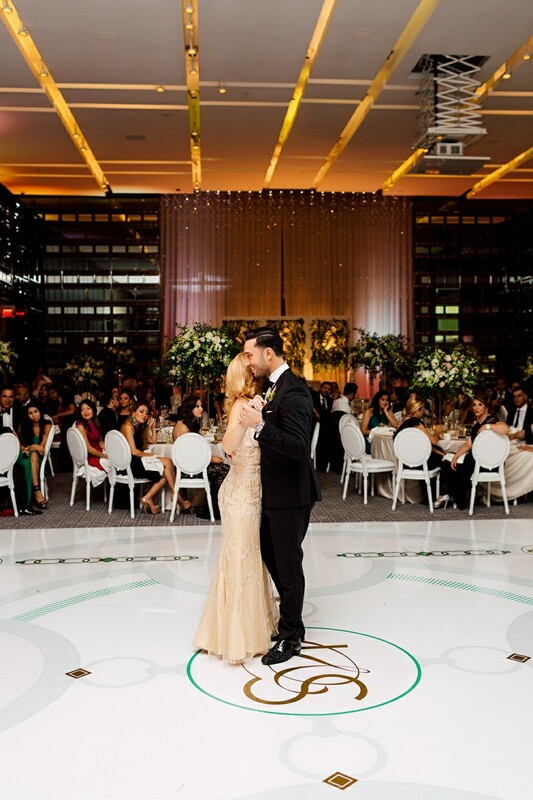 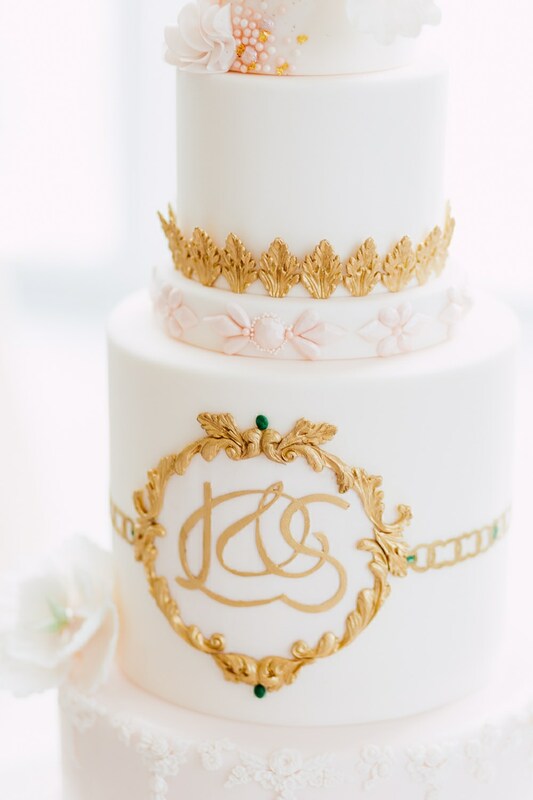 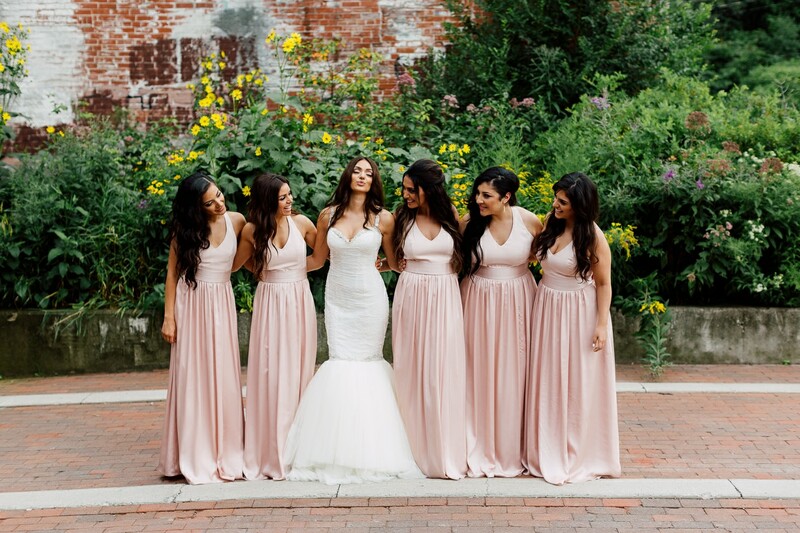 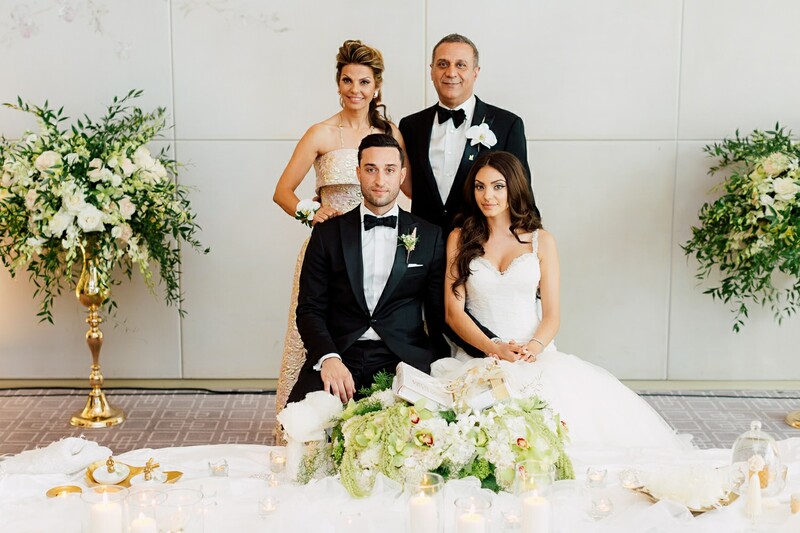 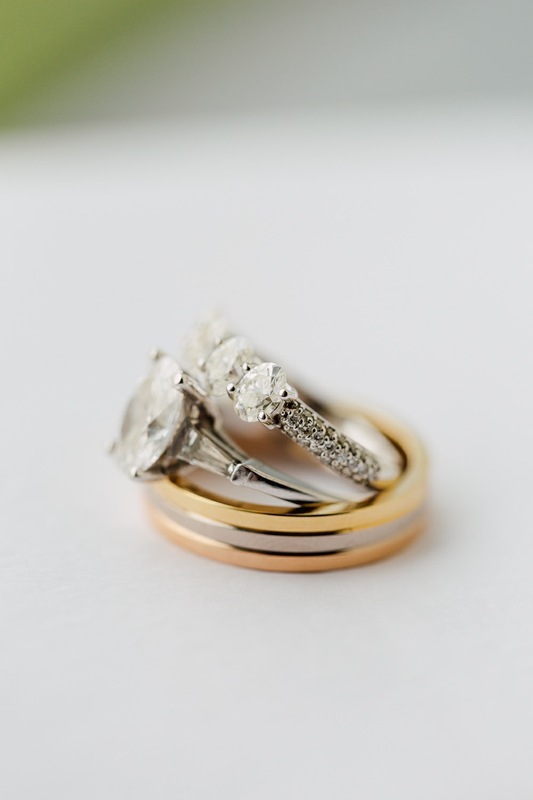 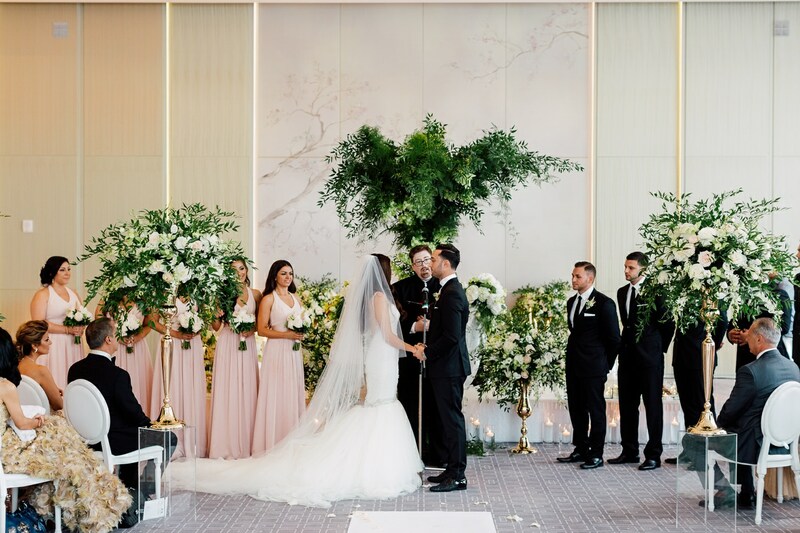 The beautiful wedding ceremony and reception all took place at the trendy Four Seasons Hotel in Yorkville. 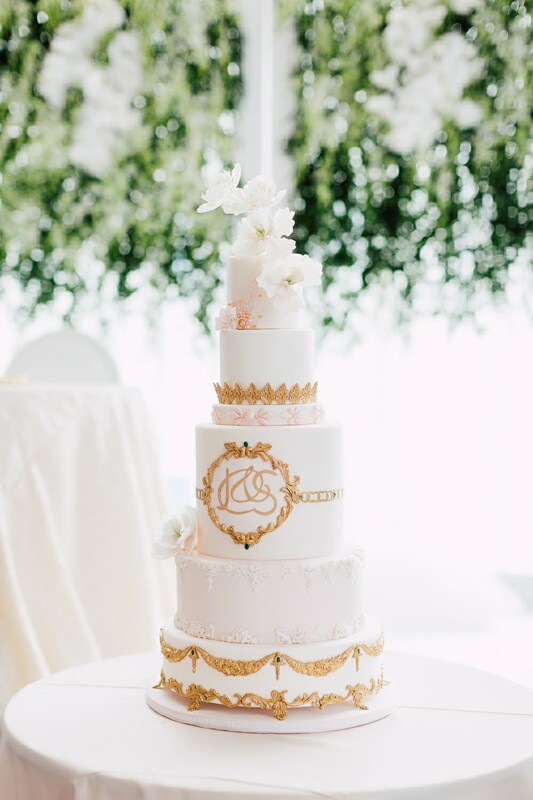 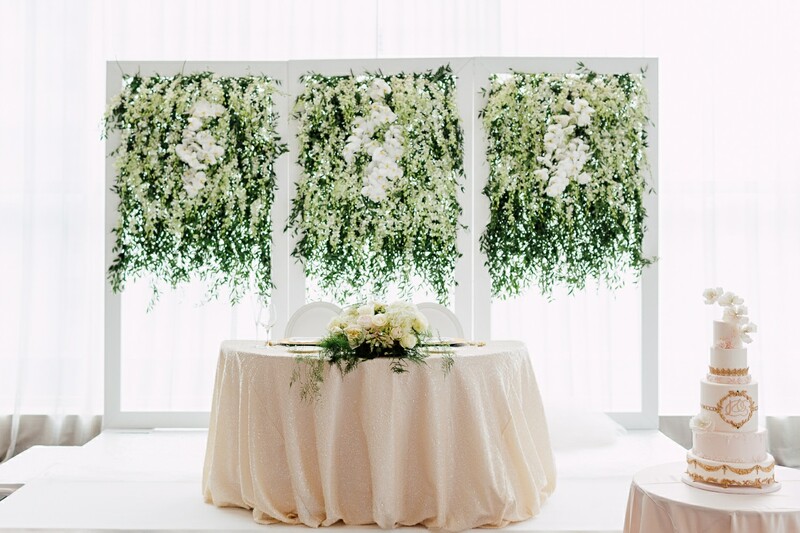 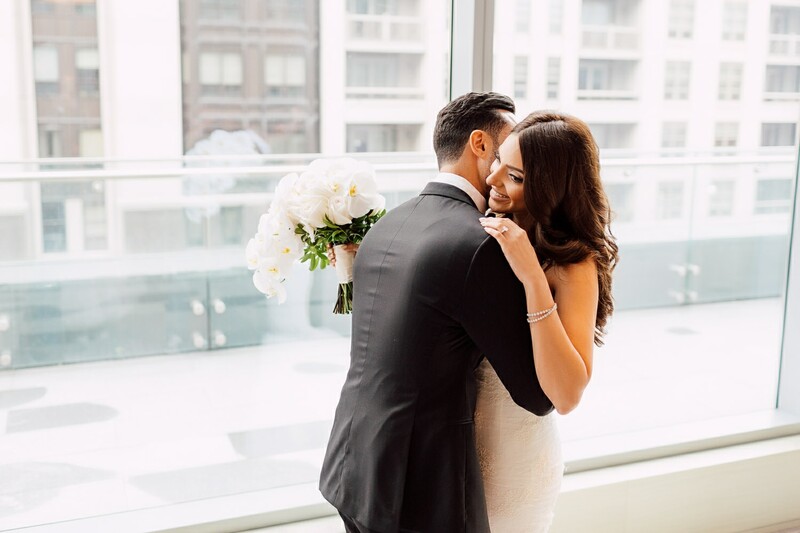 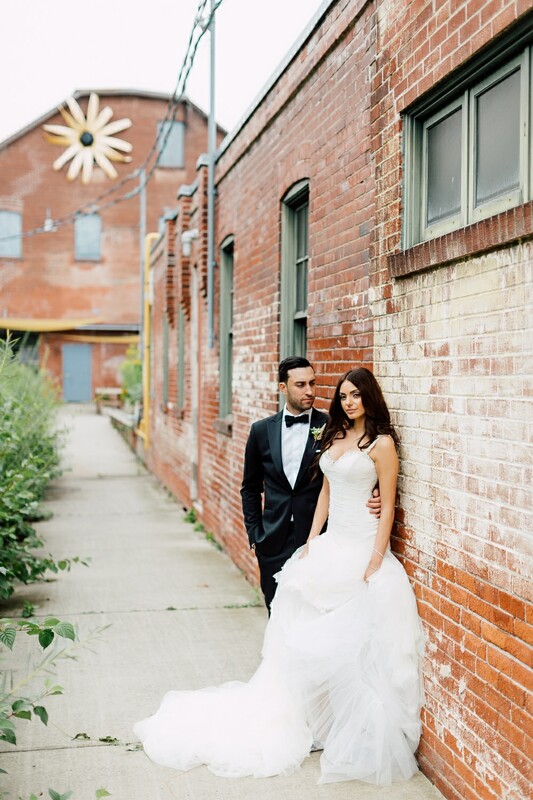 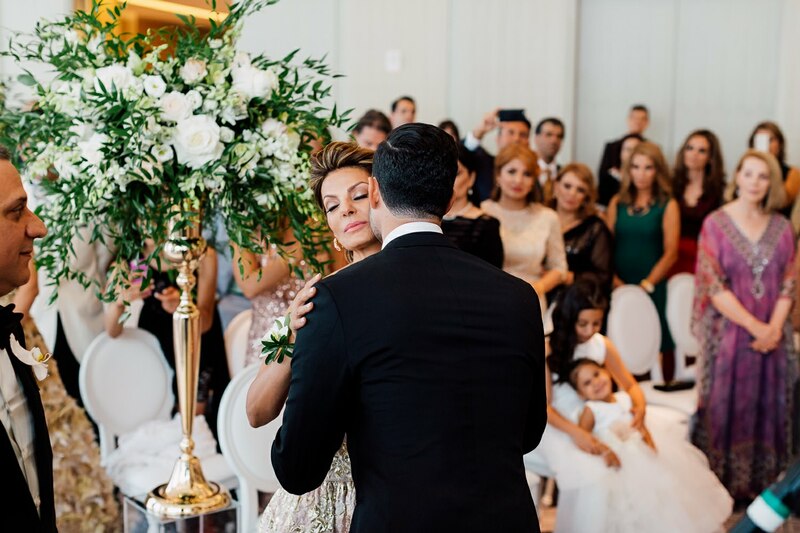 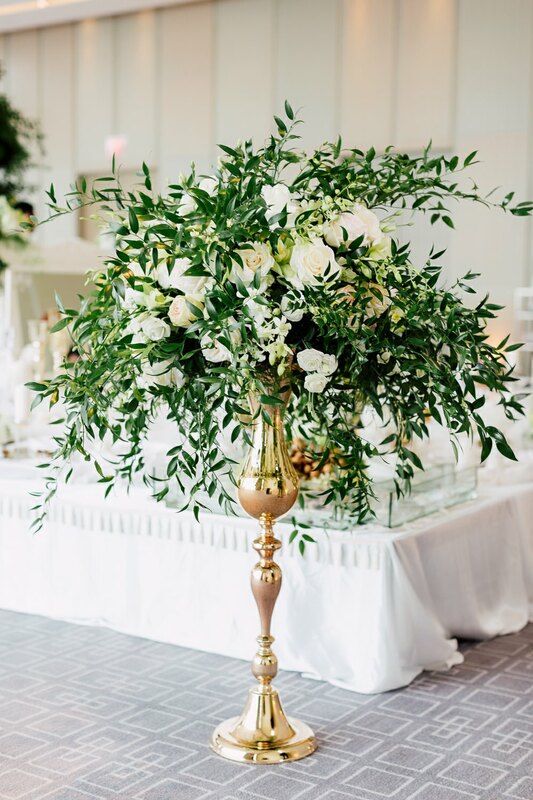 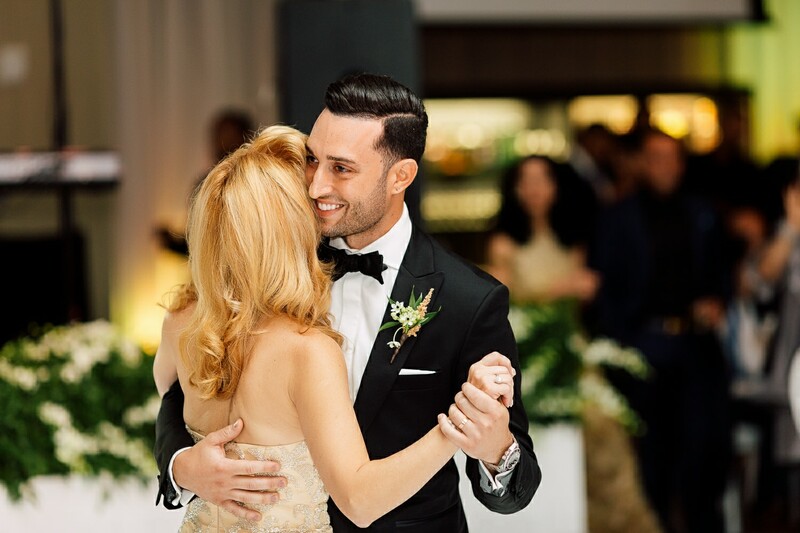 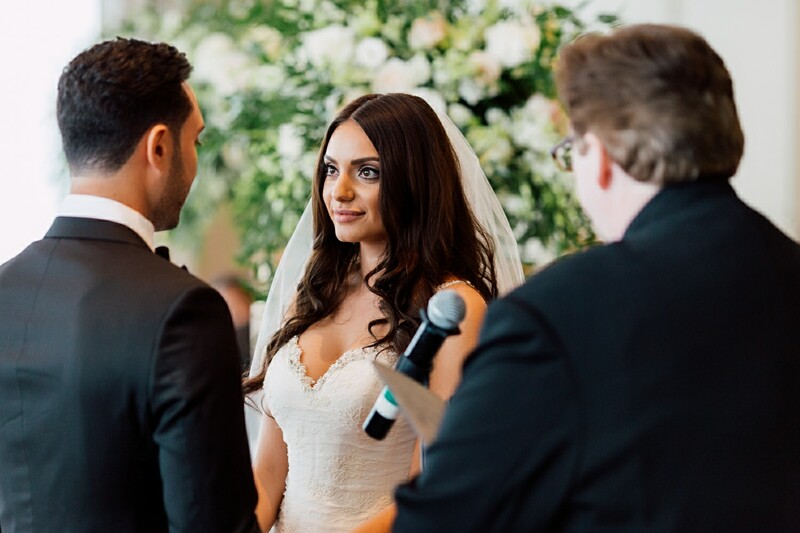 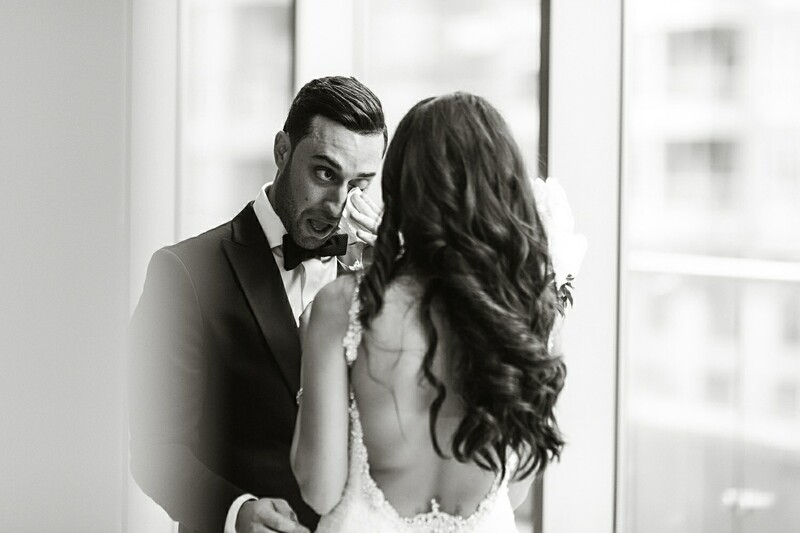 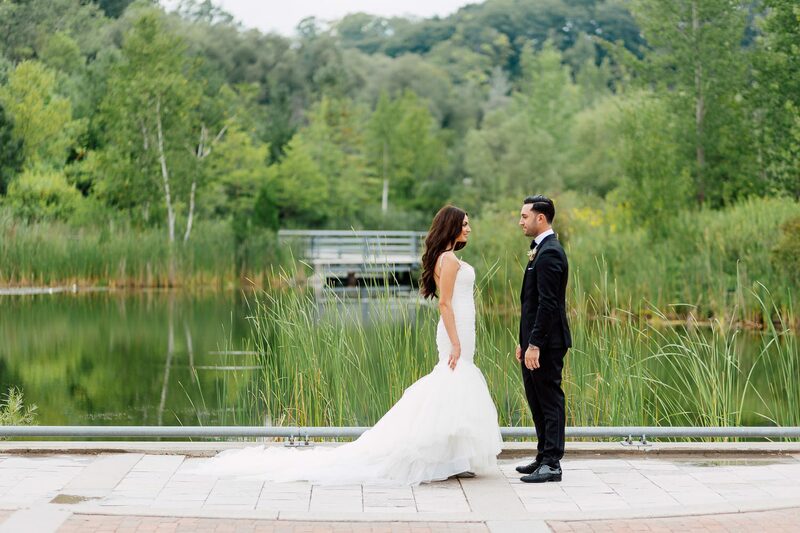 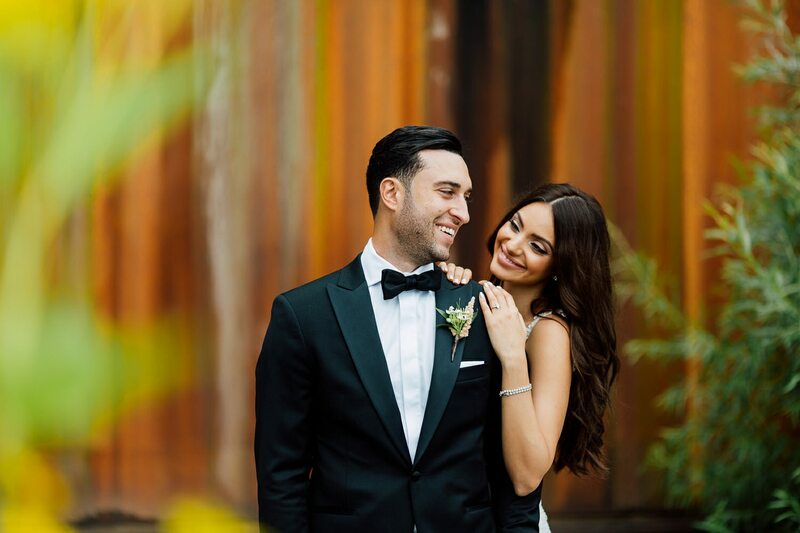 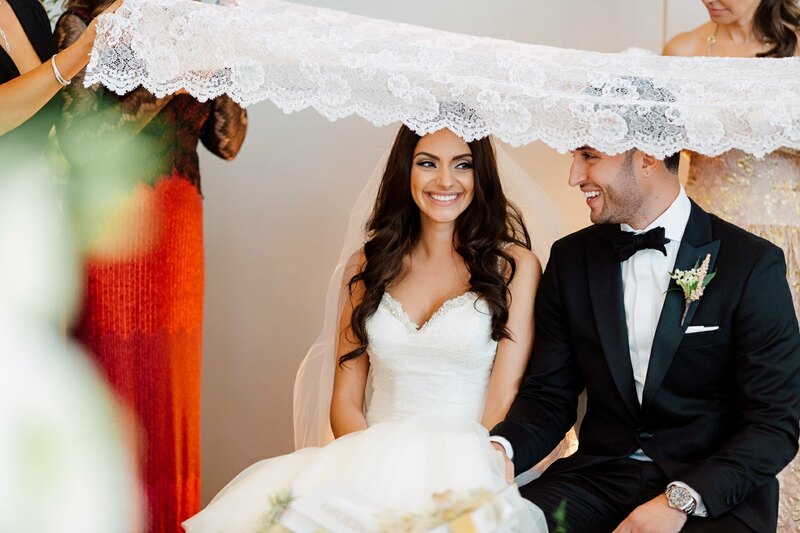 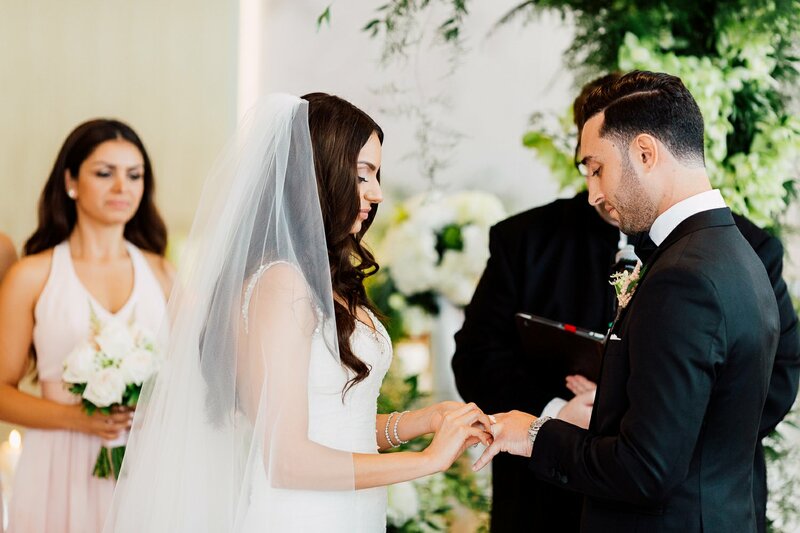 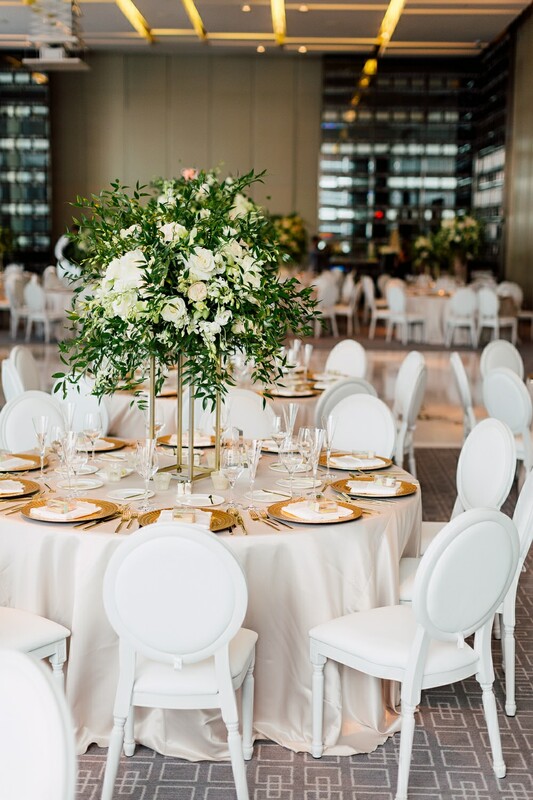 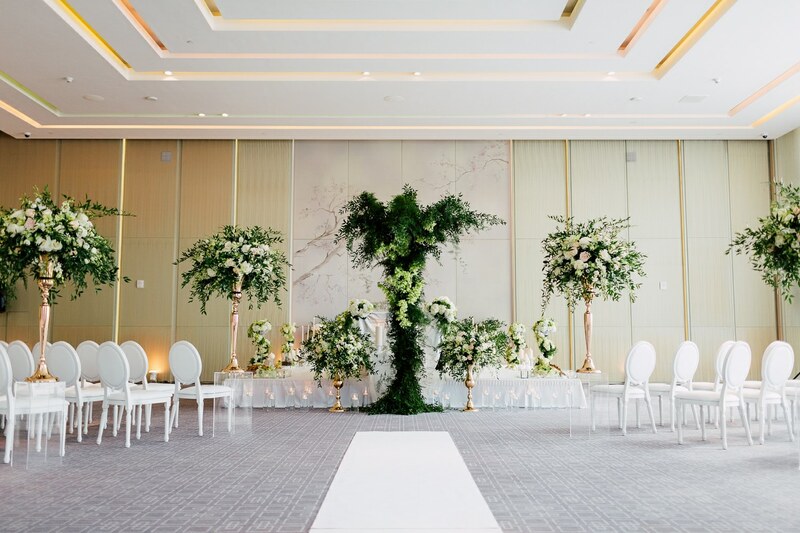 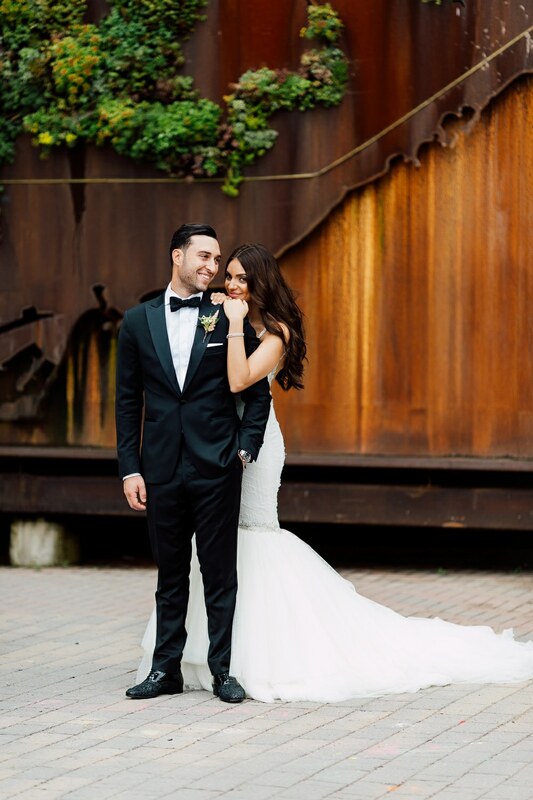 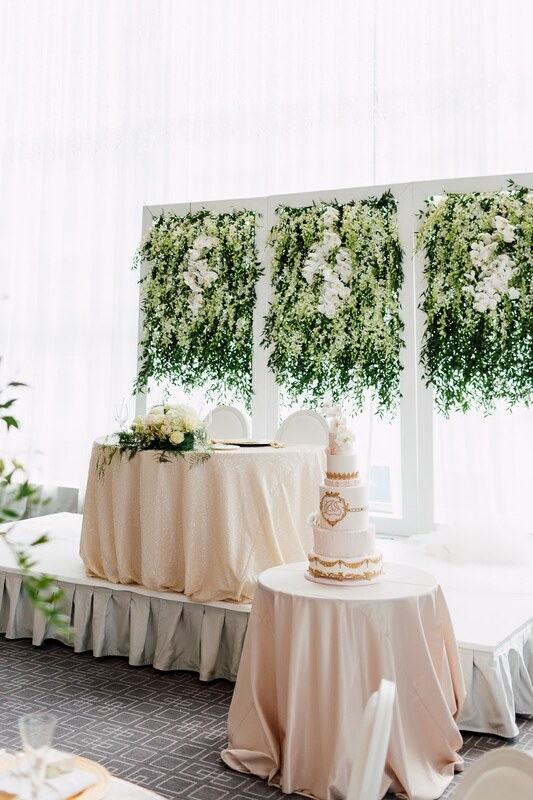 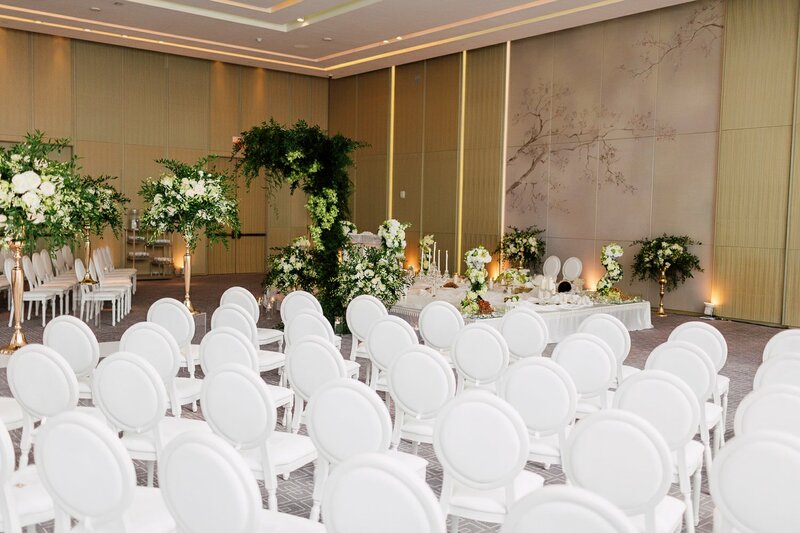 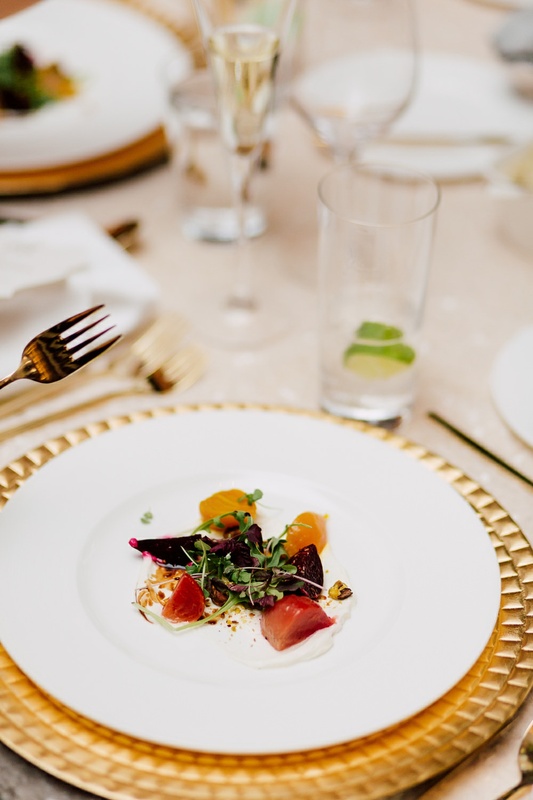 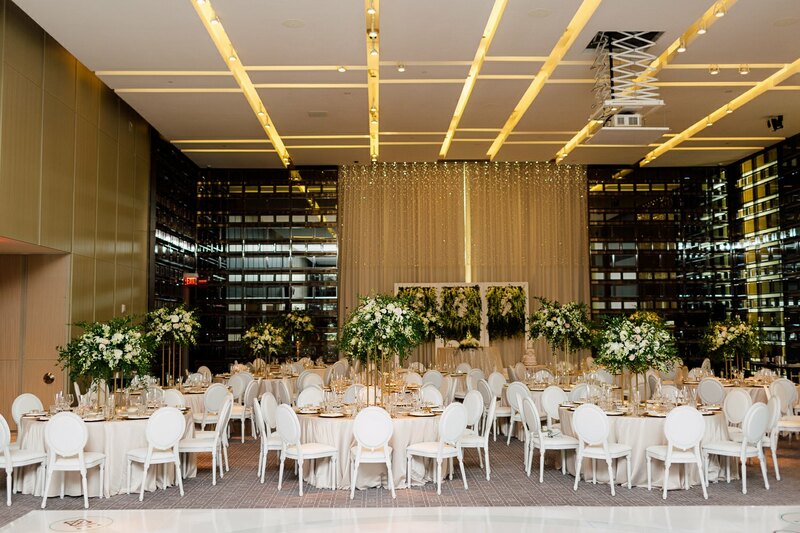 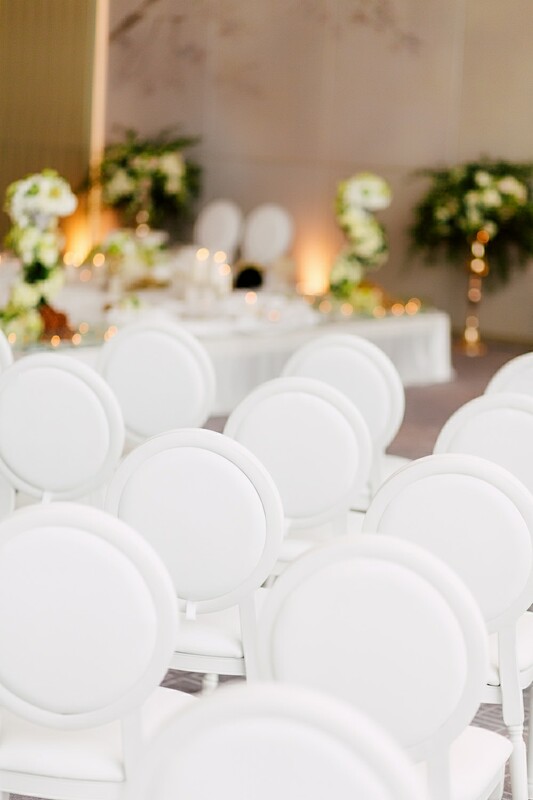 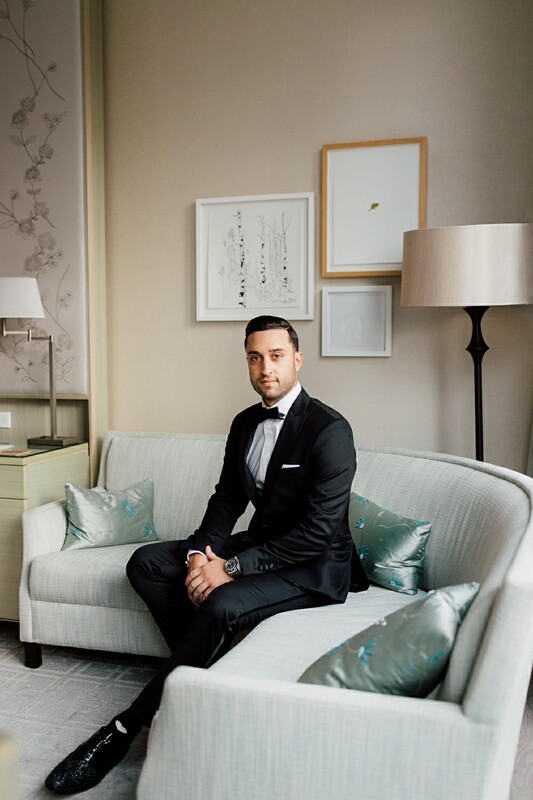 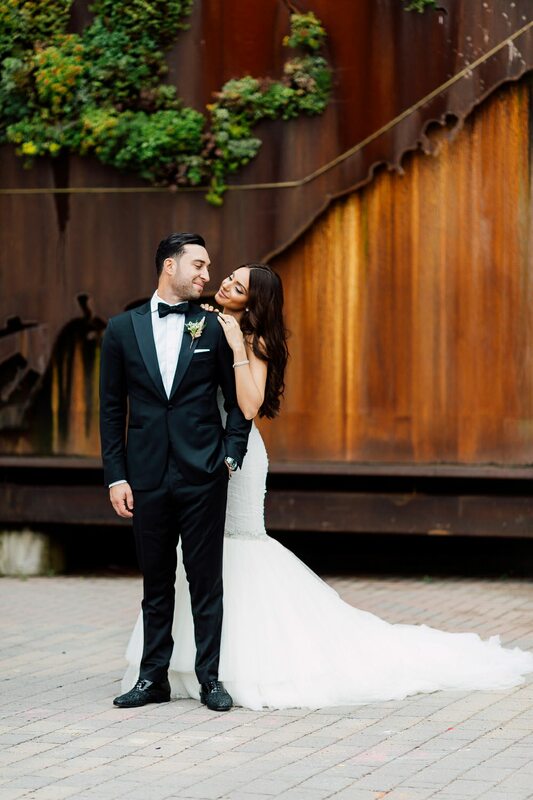 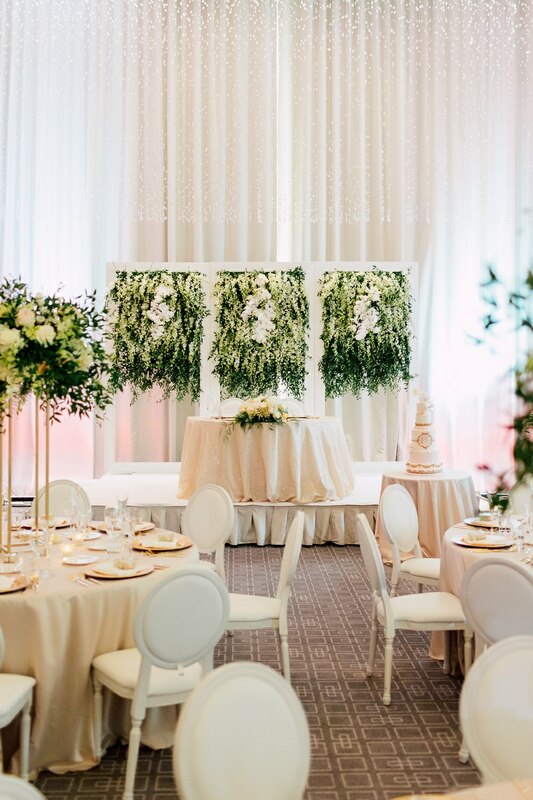 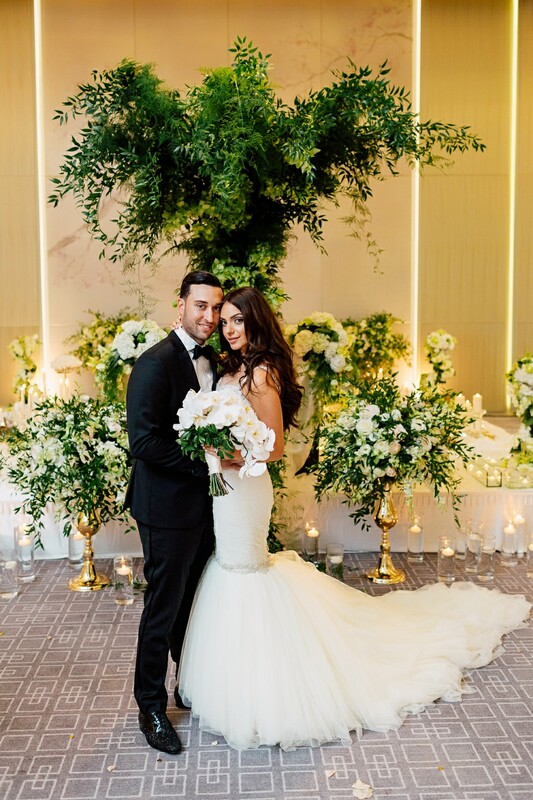 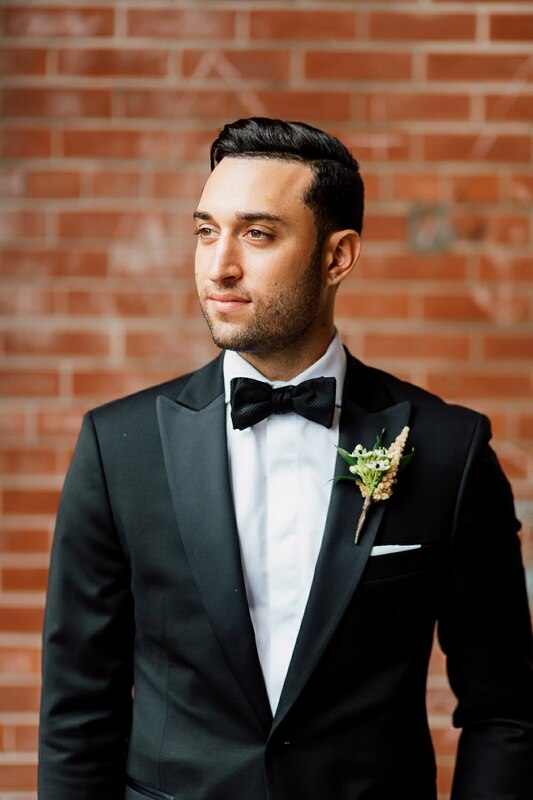 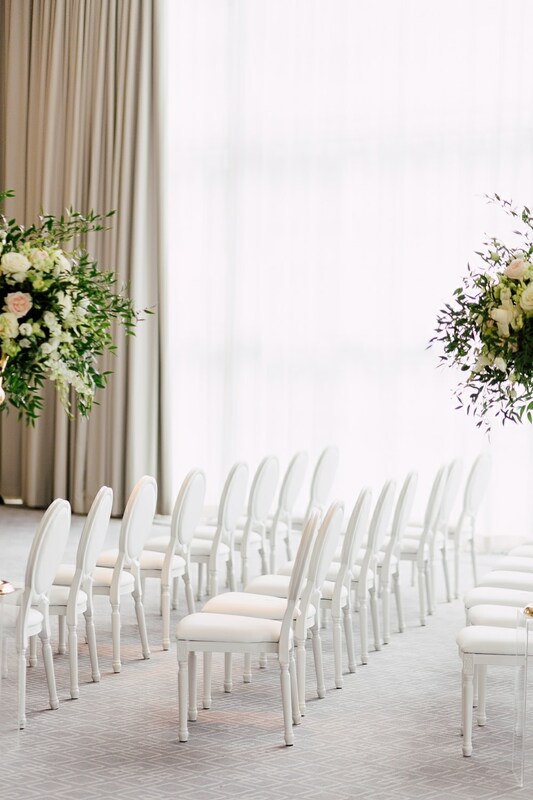 The couple didn’t want a traditional banquet hall and they both loved the high ceilings and the sophistication of the atmosphere at the Four Seasons so the beautiful hotel was an obvious choice for them. 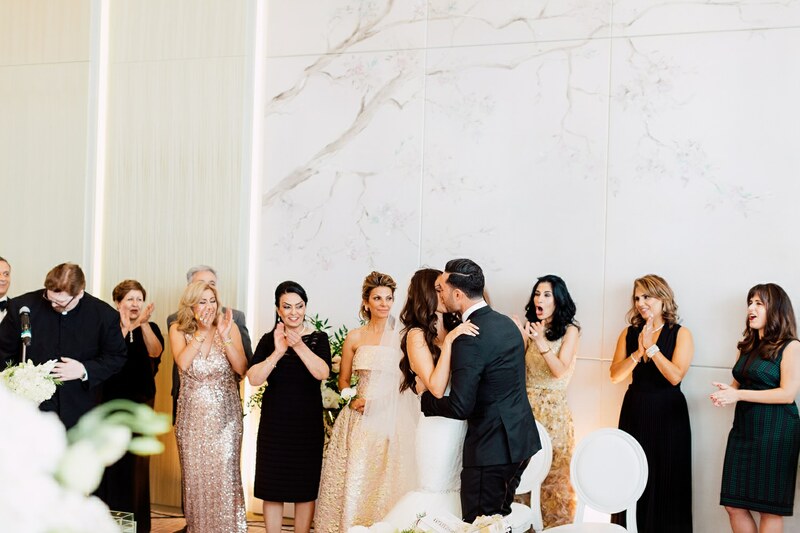 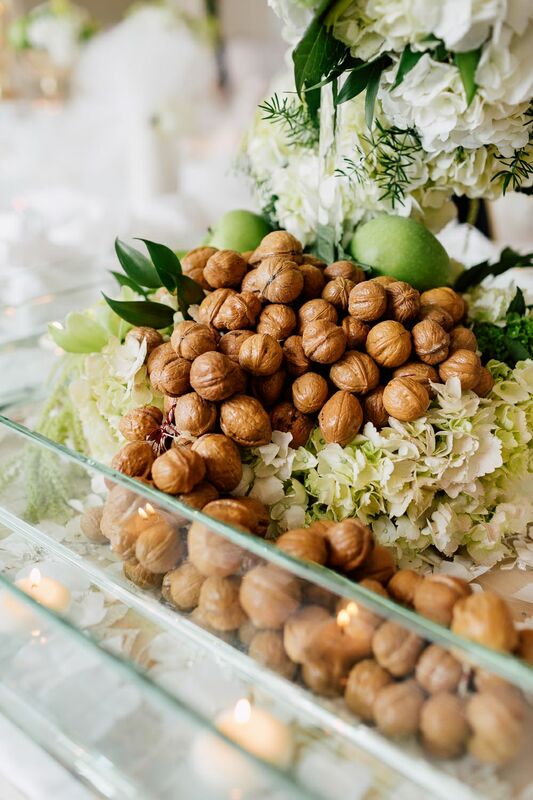 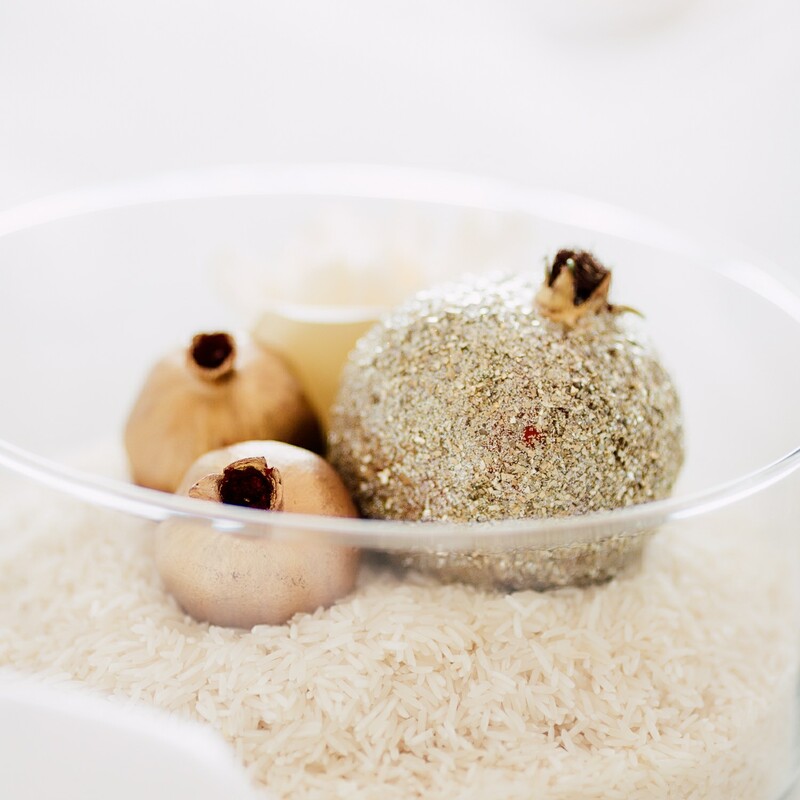 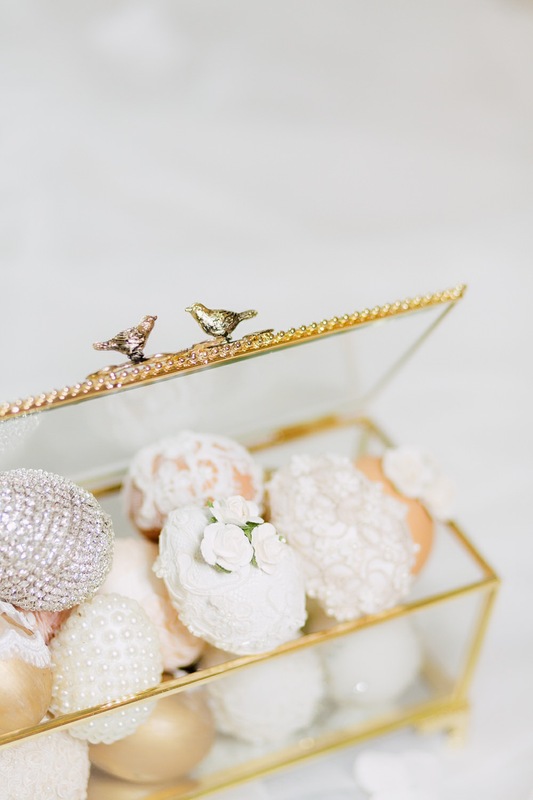 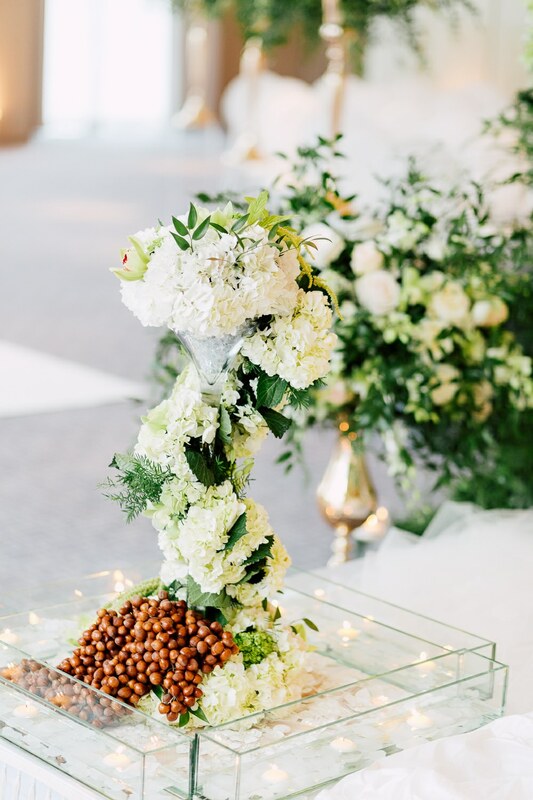 The artistic design and décor of the whole event was headed by Elle Daftarian, cousin, and one of the bridesmaids of Samira who is also the creative director of Petite and Sweet. 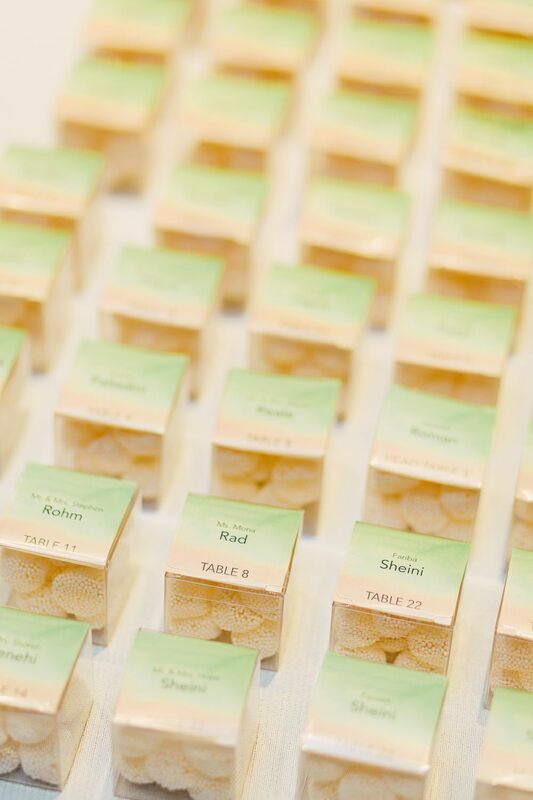 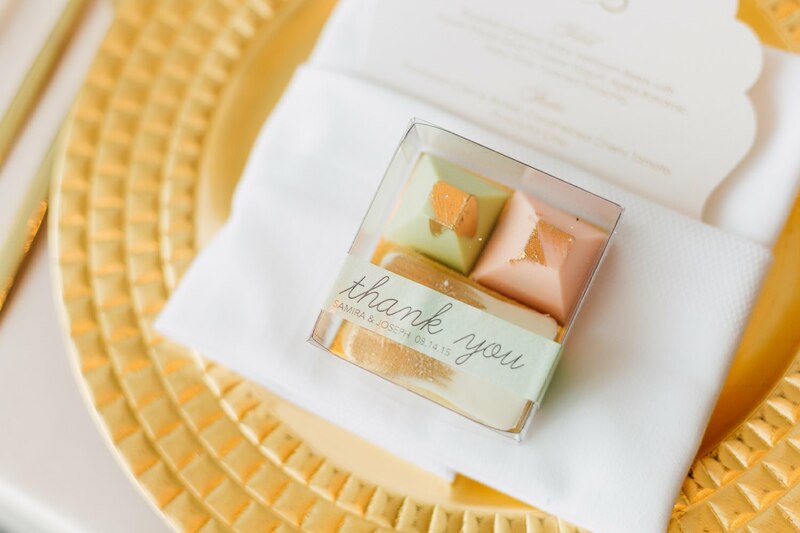 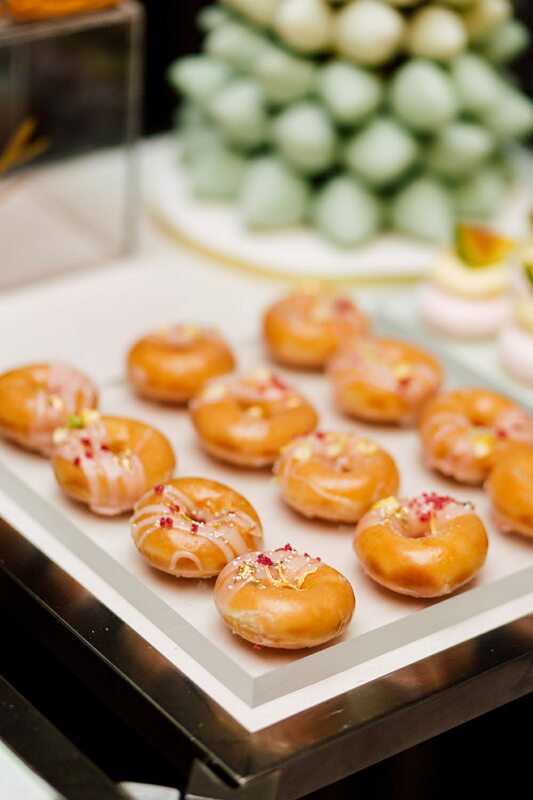 She definitely did an amazing job in organizing and planning the wedding, and also in preparing the delectable and mountains of sweets enjoyed by the guests during the reception. 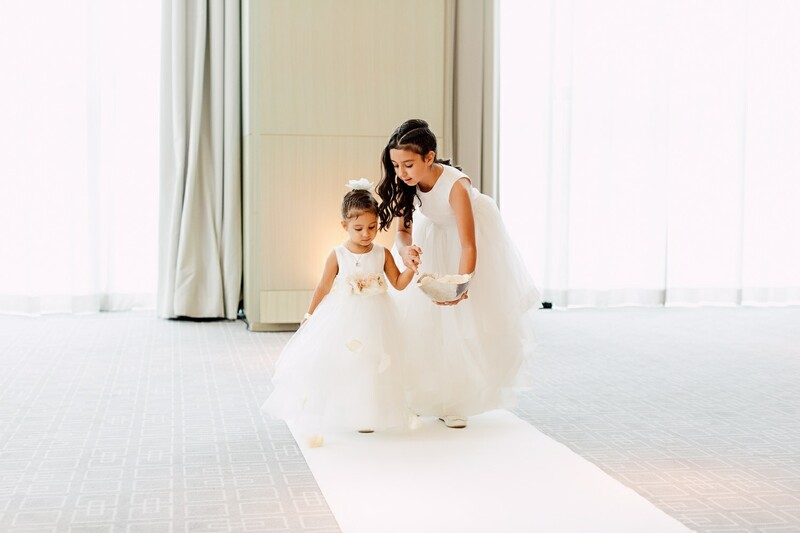 Samira and Jo had two ceremonies. 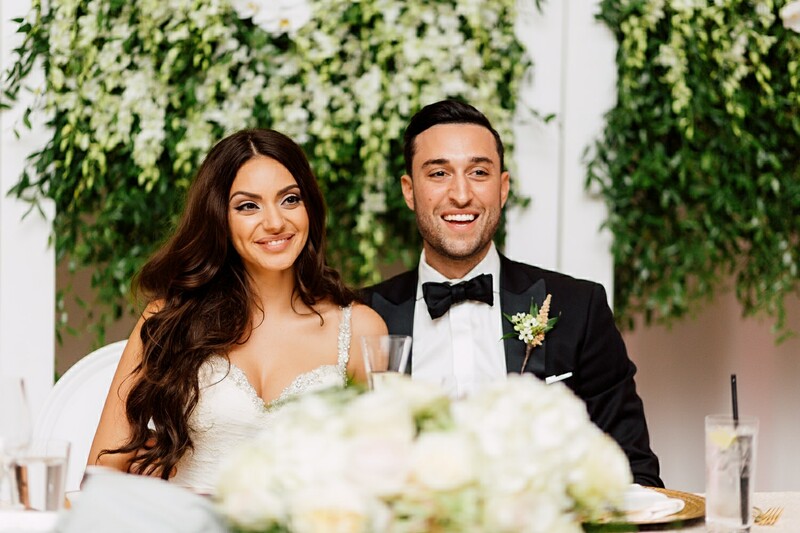 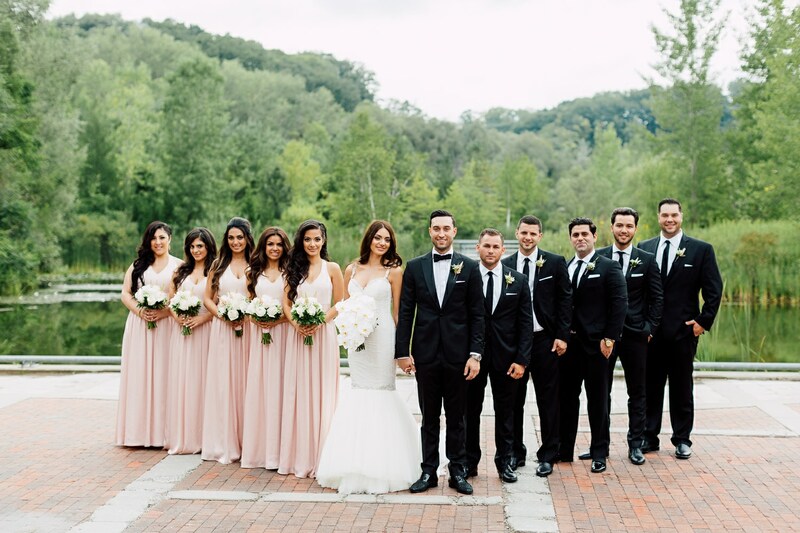 Samira is Persian while Jo is Italian so they both had a Western and Persian wedding ceremony complete with a beautiful white Sofrah which is traditional in Persian weddings. 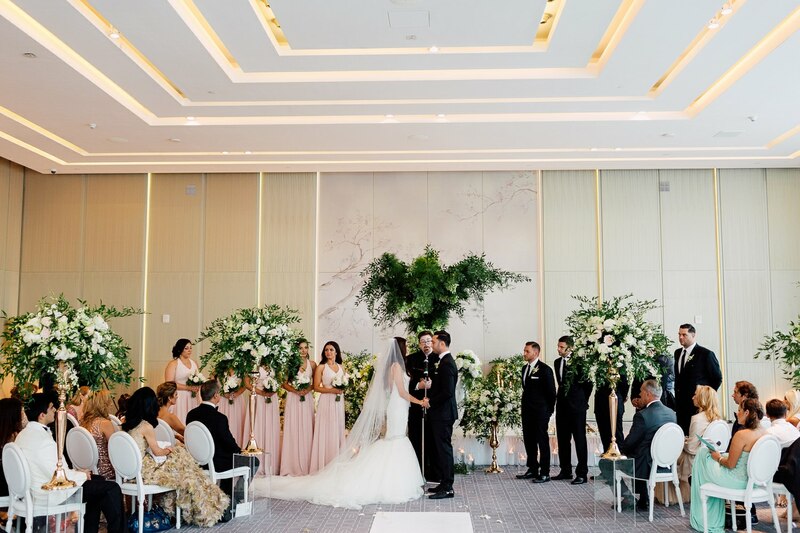 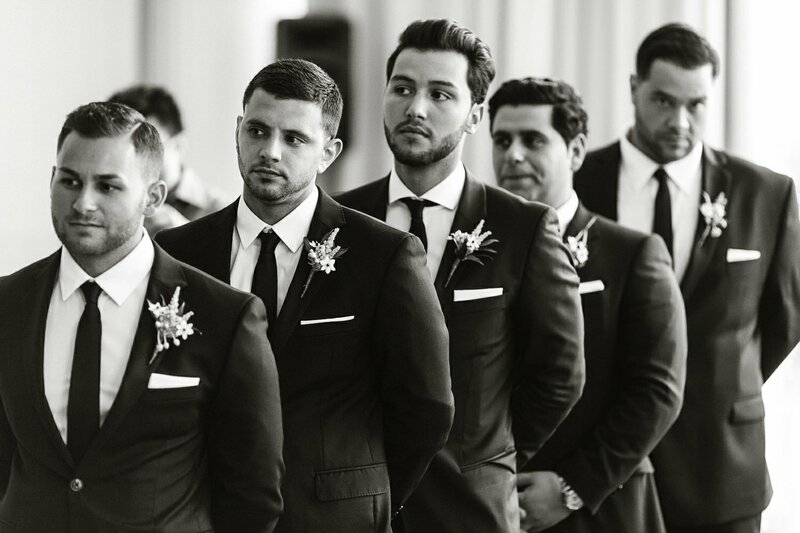 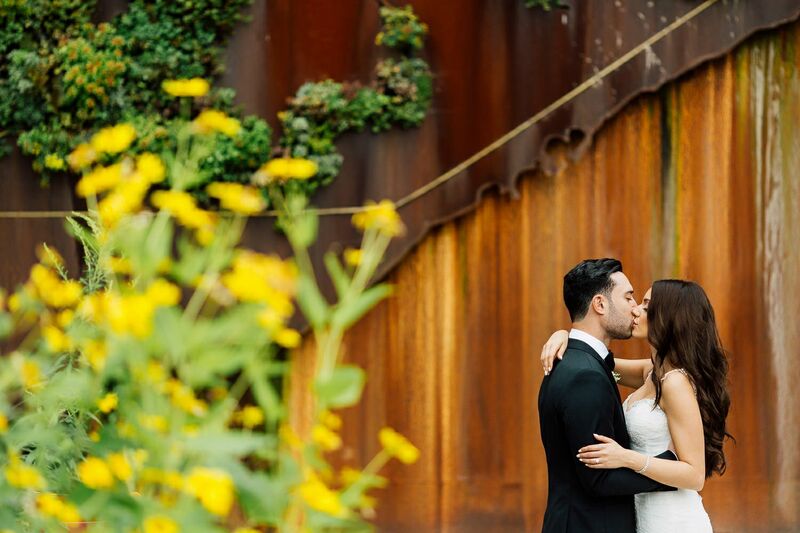 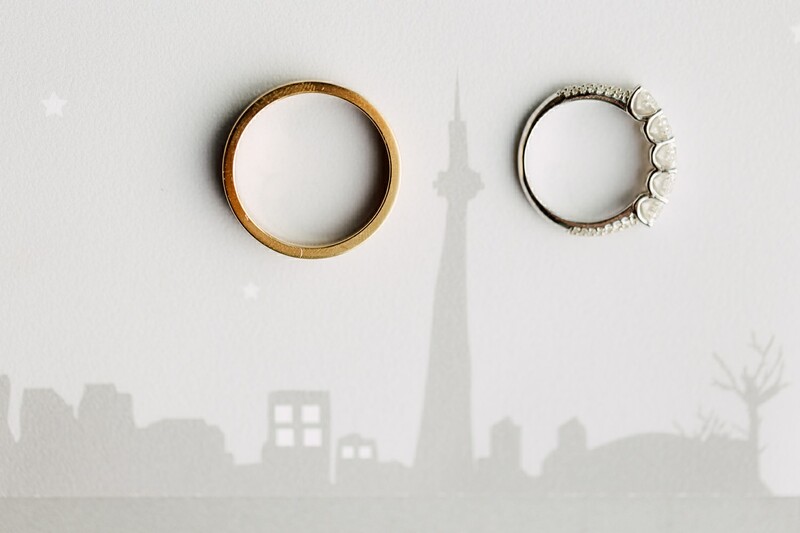 They tied the knot in a very unique and special way because the whole celebration was a perfect blend of traditional and modern. 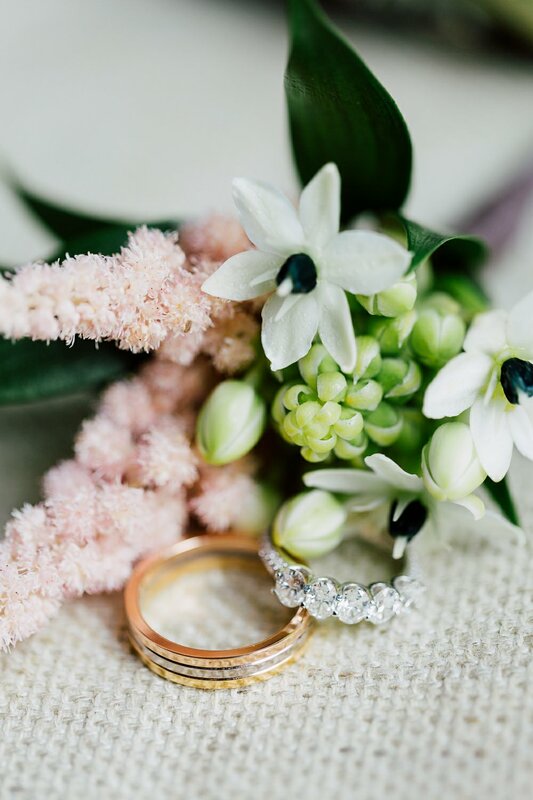 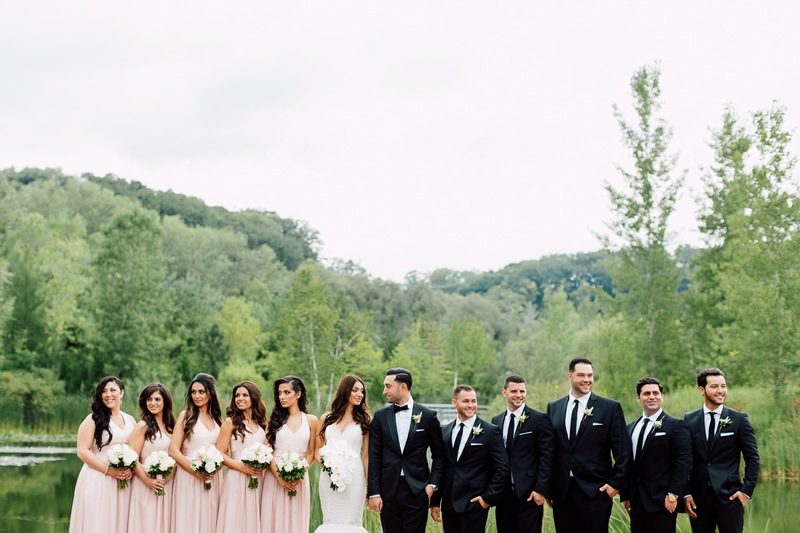 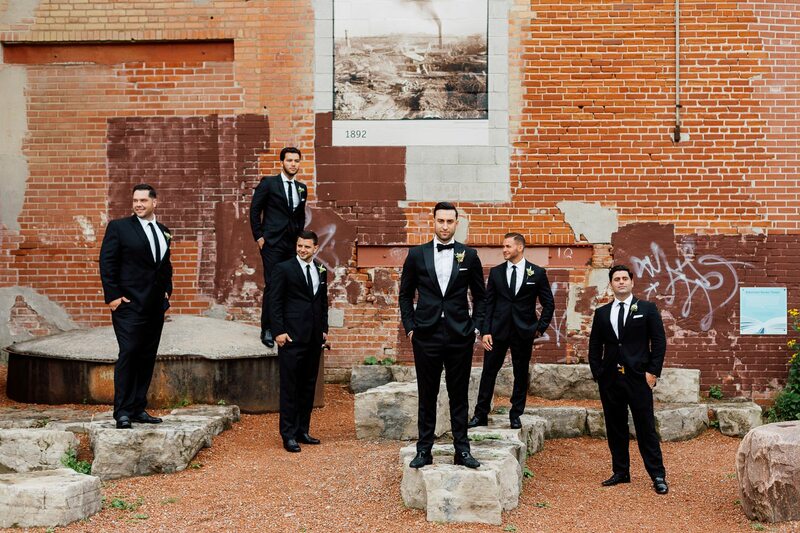 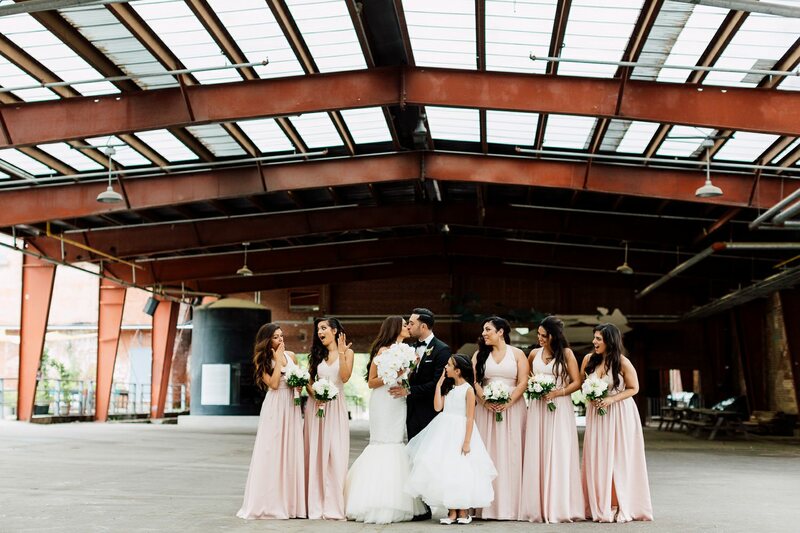 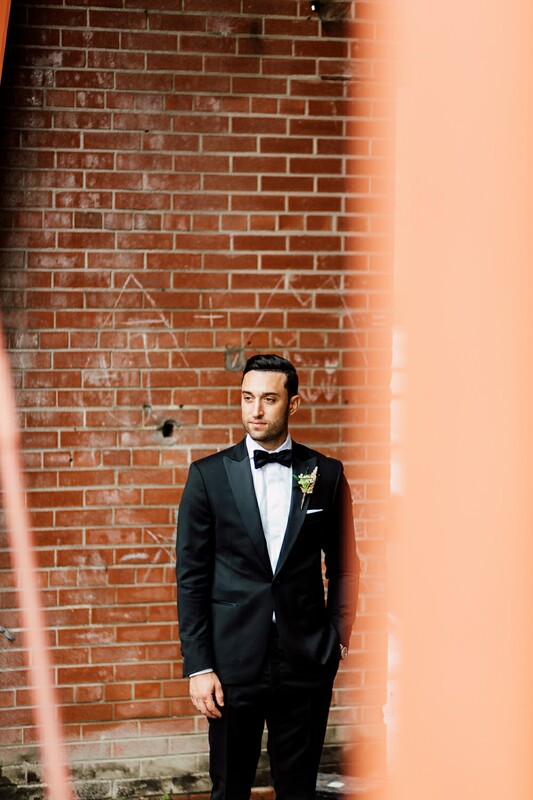 It is very rare to witness such an event because couples nowadays opt for a more contemporary style of wedding, but with Samira and Jo’s, it was such a beautiful sight to see old-style and modern flair flawlessly mixed together to unite two loving hearts. 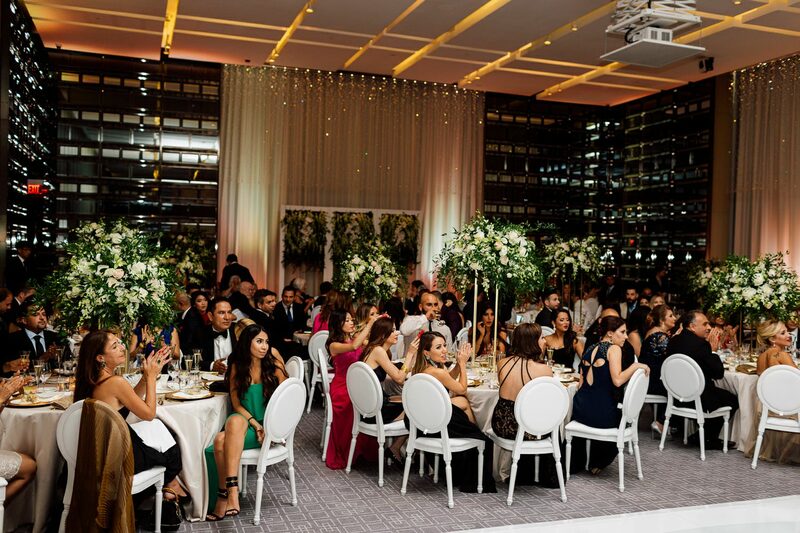 The entire venue looked splendid and dreamy. 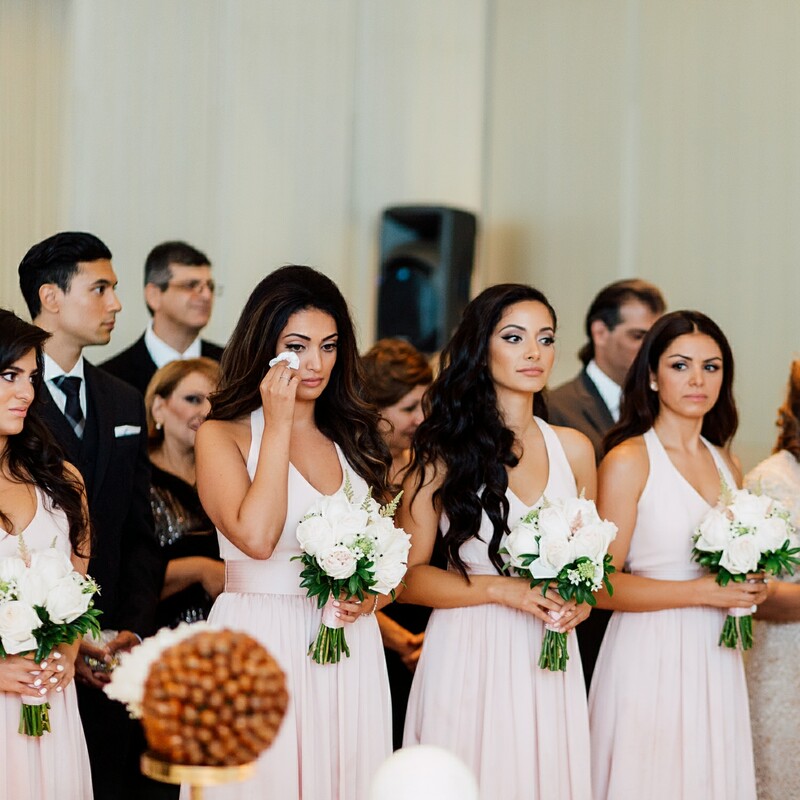 Jo was absolutely ready to make her princess a queen and everyone was teary-eyed the moment Samira entered the doors. 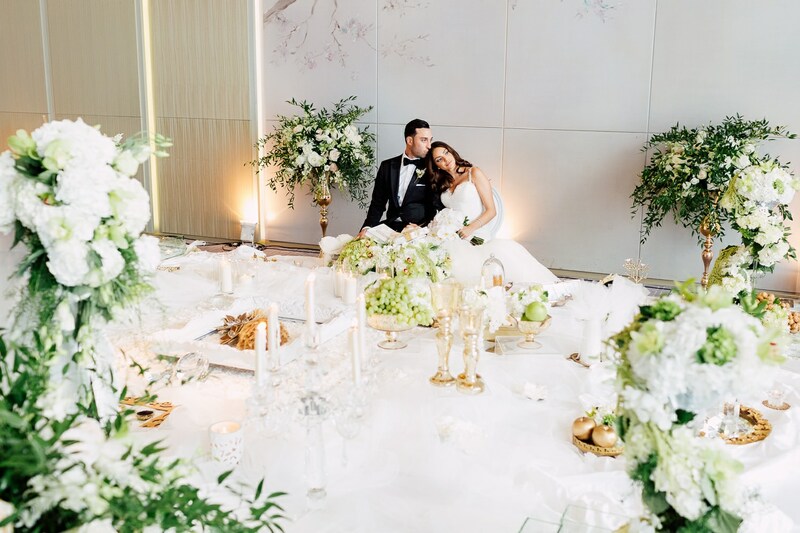 The sceneries were perfect for a magazine which were fabulous and heartwarming. 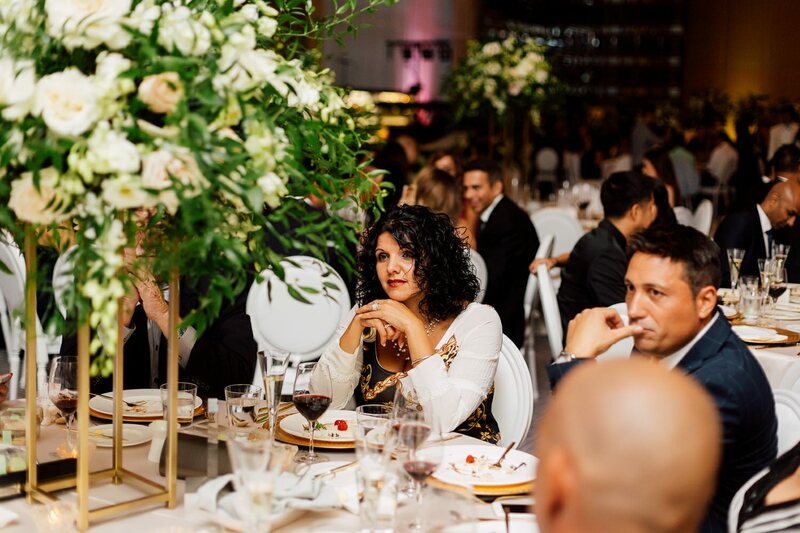 The reception was a charming sight. 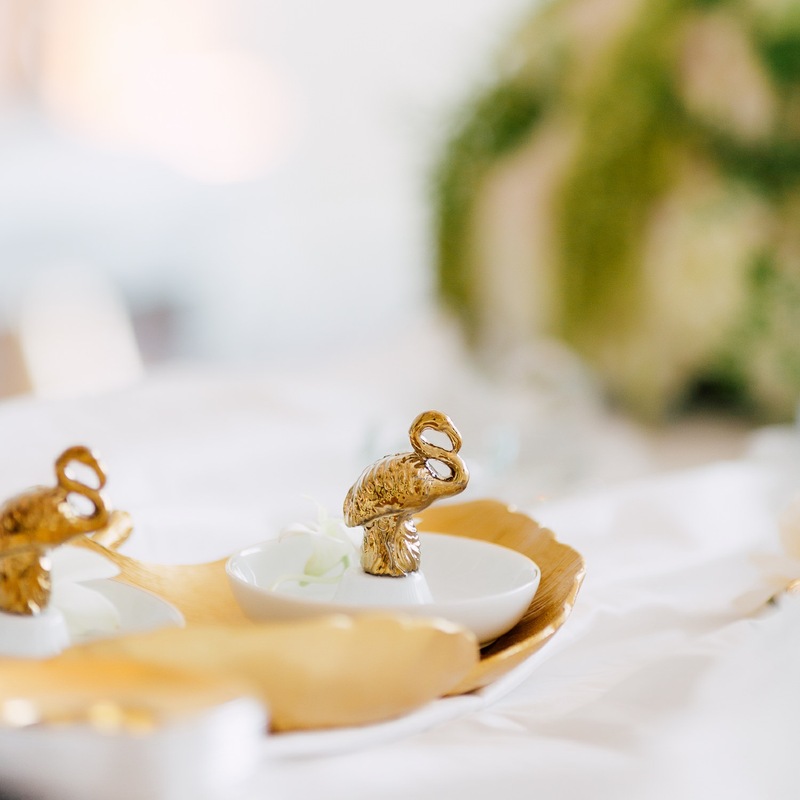 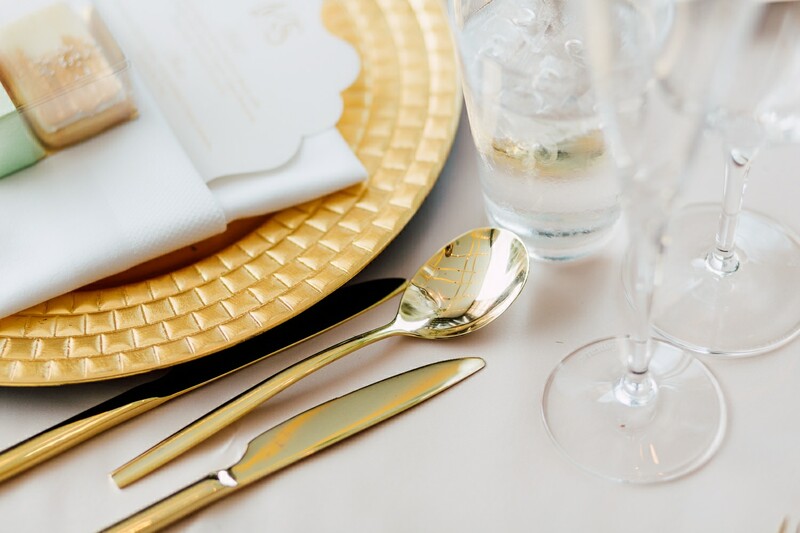 The round tabletops were filled with golden plateware, flatware, and charmingly set flowers which looked elegant and luxurious. 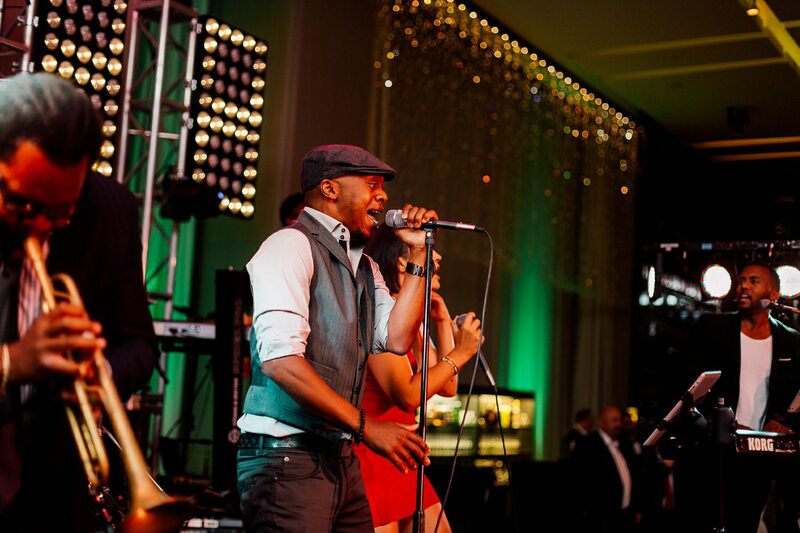 The excited crowd was serenaded and wooed by the outstanding performers of Sole Power. 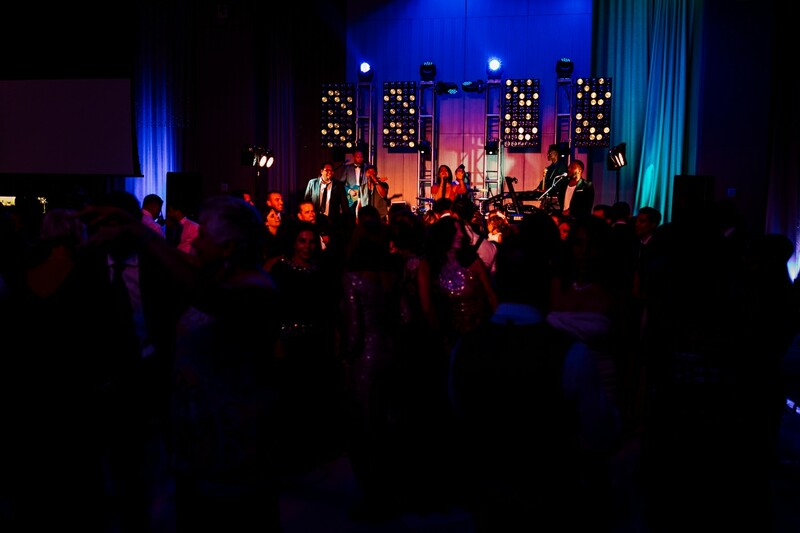 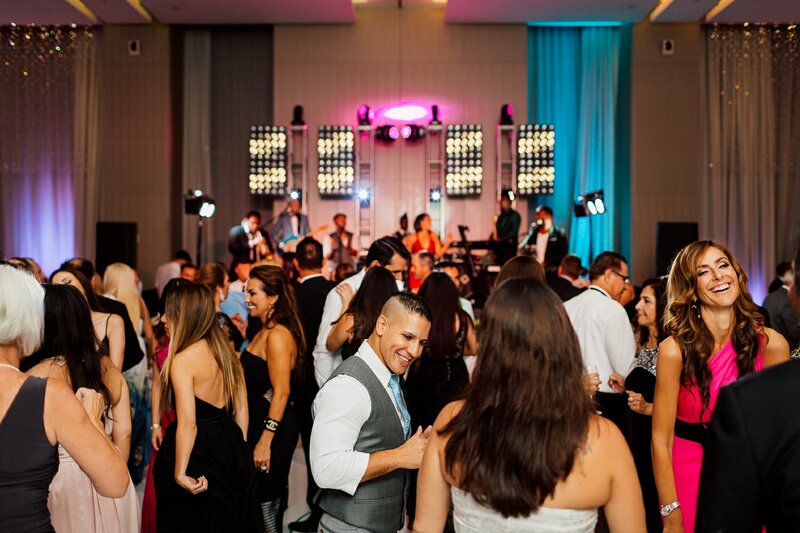 Sole Power Productions did an excellent job at entertaining and keeping the guests hyped. 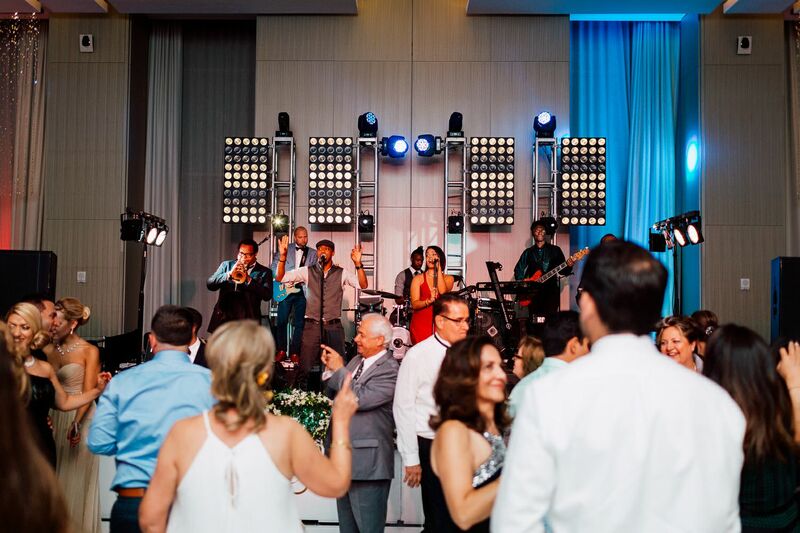 The people were impressed with the musicians’ soulful rendition of popular and classic songs. 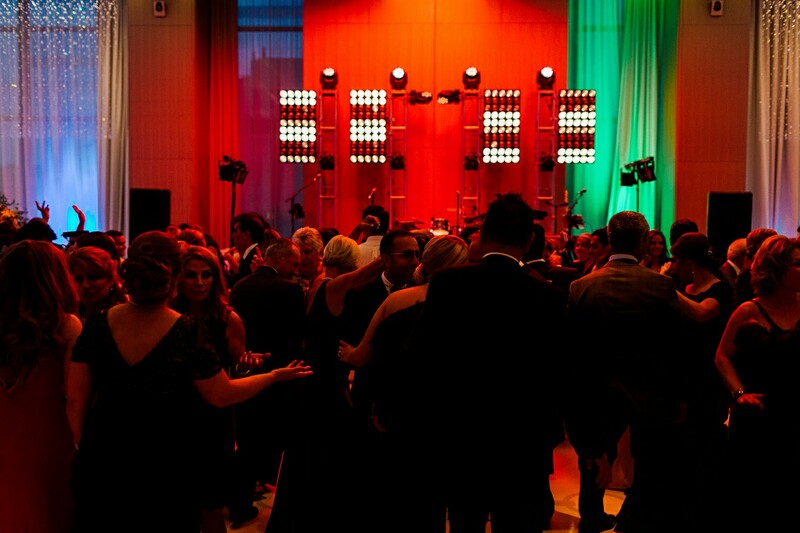 Even their set up was exceptional which looked like a real rock concert. 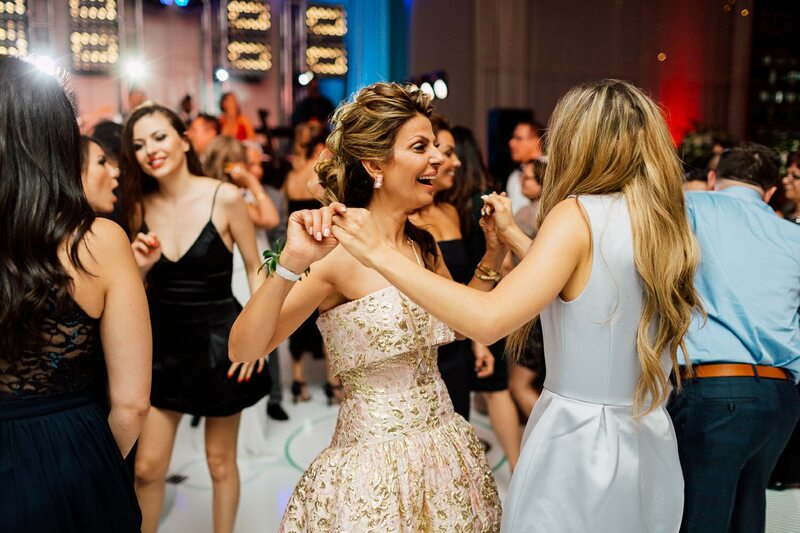 The night ended with a joyful noise and a resounding fulfillment. 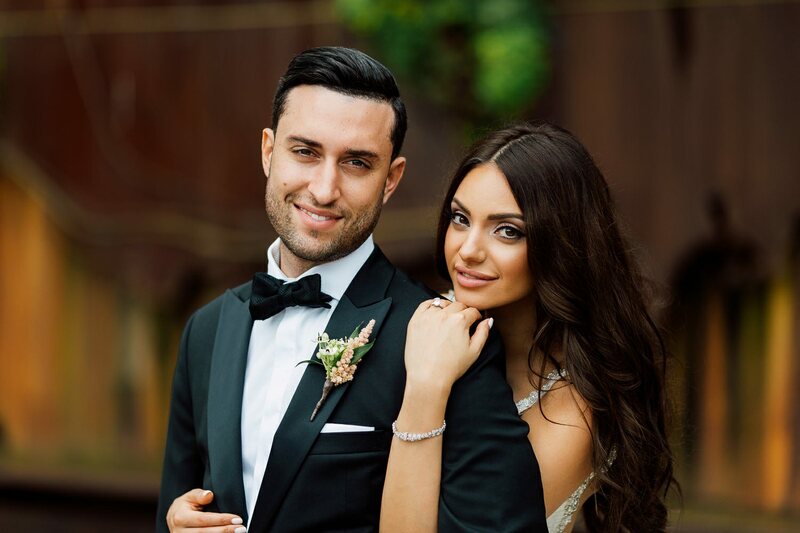 The beautiful love story of Samira and Jo is starting another chapter and we are sure that this killer couple will definitely live a happily ever after.